Captured in a height of 2,200 meters from the sea level we can see the clouds and Fog near the border of Caldera de Taburiente – a very large volcanic crater with about 10 km across. Above the horizon the sun sets behind the silhouette mountains of Roque de Los Muchachos, where stands a huge complex with the some of the largest telescopes in the world. The picture was taken in Pico de La Cruz, La Palma, Canary Island. The well known Great Nebula M42, in Orion constelalltions, is one of the brightest nebulae in the celestial sphere, cleary visible to the naked eye with an apparent visual magnitude of 4, is located at a distance of about 1500 light years. At about 30 light-years in diameter, this great big cocoon nebulous is giving birth to perhaps a thousand stars. 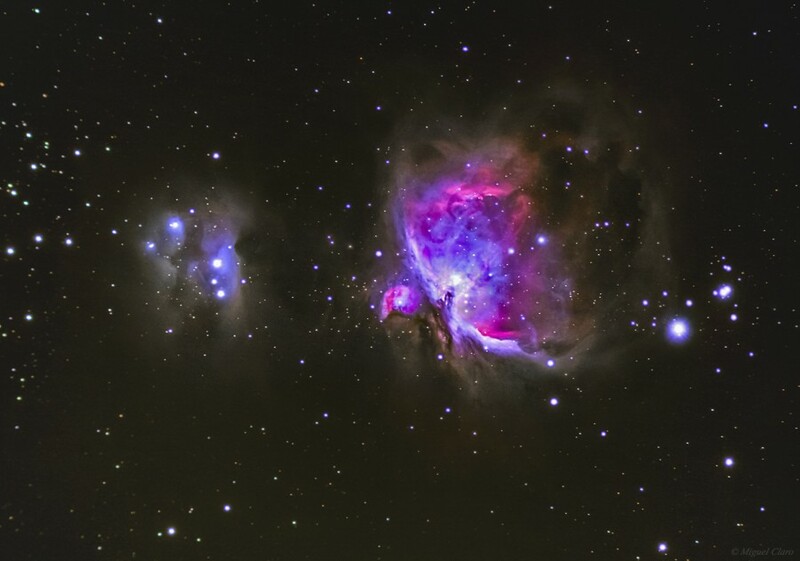 Physically part of the Great Nebula (in this image, at left of M42) is M43, a “circular” shaped emission nebula that appears separated from M42 by a dark dust lane in the foreground. Near the left edge of this picture, is an interstellar cloud of dust reflecting light from hot young stars. It is composed of three regions known as NGC 1977, NGC 1975, and NGC 1973. The Orion nebula is the closest region of massive star formation to Earth, and has revealed much about the process of how stars and planetary systems are formed from collapsing clouds of gas and dust. Astronomers have identified around 700 stars that are formed from this nebula. The red areas in the nebula are mostly shining from hot hydrogen gas in the nebula. The blue areas are mostly dust that reflects the light of the hot blue stars. The red hue is a result of the Hα recombination line radiation at a wavelength of 656.3 nm. The blue-violet coloration is the reflected radiation from the massive O-class stars at the core of the nebula. This nebula is part of the much larger Orion Molecular Cloud Complex, that includes M78 and the Horsehead Nebula. An impressive deep wide view of our home galaxy, the Milky Way, as seen from Los Andenes, La Palma Sky, Canary island. At left, near the rocky horizon and above the galactic center, we can see the Lagoon Nebula (M8) and the Trifid Nebula (M20), as well as M22, M23, M24 and M25, the Omega nebula (M17) and Eagle Nebula (M16). Two degrees north of the Eagle Nebula, we can find the NGC6604 and above it, in the center of the image (brightest area), the great Scutum Star Cloud. Near of it, we find the M11 and M26. Above the center image, we find the IC4756 and NGC6633. In the both corners of the picture we can find dark dust clouds. Above the rocky horizon of Roque de Los Muchachos (at right), where stands a huge complex with 15 telescopes, some of the largest telescopes in the world, we can find a faint presence of green airglow, where is also visible the silhouette from one of this telescopes. In this picture, taken in Los Andenes, near Roque de Los Muchahos, in La Palma, we could see the strong light of planet Venus (the strongest light in the image) inside the stellar asterism with a trapezium shape, that forms the Libra constellation. At the left edge of the image, we see the central region of Milky Way and the entire constellation of Scorpius, with is brightest star Antares. Below the horizon, we found an ocean of clouds, located inside the Caldera. The rocky silhouette is part of Roque de Los Muchachos, where stands a huge complex with the some of the largest telescopes in the world. From lower left to the right side of the picture, we can see the silver dome of Gran Telescopio Canarias (GTC) with a 10,4 meters primary mirror reflecting telescope. It is designed to incorporate the most up-to-date technology and it is one of the most advanced telescopes in the world, actually, the largest one until now in the optical-infrared system. At right center, in the foreground, we can see the silhouette of the First G-APD Cherenkov Telescope (FACT), that is the first imaging atmospheric Cherenkov telescope using Geiger-mode avalanche photodiods (G-APDs) as photo sensors. The rather small, low-cost telescope will not only serve as a test bench for this technology in Cherenkov astronomy, but also monitor bright active galactic nuclei (AGN) in the TeV energy range. The First G-APD Cherenkov Telescope is assembled in Roque de Los Muchachos on the MAGIC site, mounted in the focus of one of the former HEGRA telescopes (CT3). 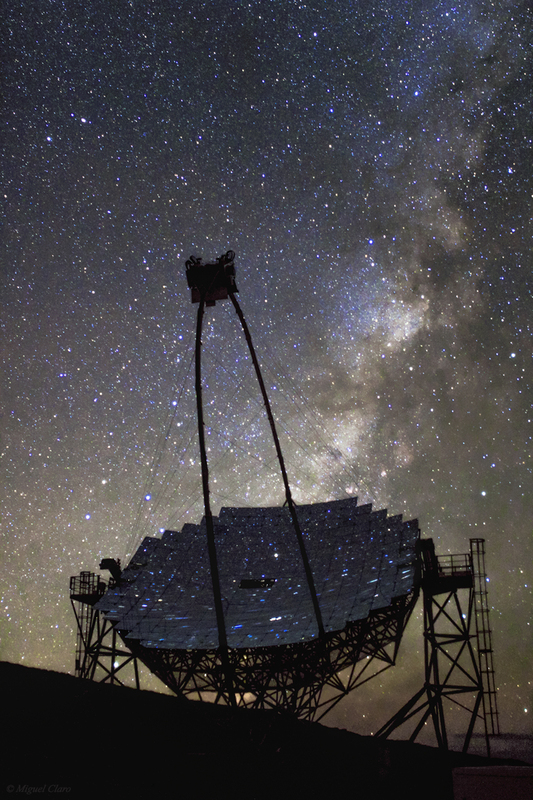 In the background, the beautiful light coming from the central region of Milky Way is shining against the telescope structure, reflecting on its mirror surface. Behind the GTC dome, the sky is shining as a smooth band of an orange airglow, normally from oxygen atoms at 150-300km high where the atmosphere is so sparse and collisions so infrequent that the atoms have time to radiate ‘forbidden’ light. In the foreground we can see the MAGIC I telescope (Major Atmospheric Gamma-ray Imaging Cherenkov Telescopes) in front of the Milky Way, with many of colorful stars mirrored in its surface of 236 m2. MAGIC is a system of two Imaging Atmospheric Cherenkov telescopes situated at the Roque de los Muchachos Observatory on La Palma, one of the Canary Islands, at about 2200 m above sea level. MAGIC detects particle showers released by gamma rays, using the Cherenkov radiation, i.e., faint light radiated by the charged particles in the showers. With a diameter of 17 meters and 236 m2 reflective surface, it was the largest in the world before the construction of H.E.S.S. II. MAGIC is not only huge, but also pioneers a number of technical developments that had never been applied to Cherenkov telescopes before. The mirror is extremely light and can be moved to any position in the sky in less than thirty seconds. It is made up of 270 individual mirror panels that can be independently focussed using an active mirror control system equipped with lasers. The cosmos and its evolution are studied using all radiation, in particular electromagnetic waves. The observable spectrum extends from radio waves to infrared, visible, ultraviolet, X-ray, gamma-rays and finally very high energy gamma rays (starting at energies of 10 GeV). Observations at visible wavelengths (.5 to 1 micrometer) have a history of centuries, gamma astronomy by satellites (keV to few GeV) and ground-based telescopes (above 300 GeV) are end-of-20th century newcomers. 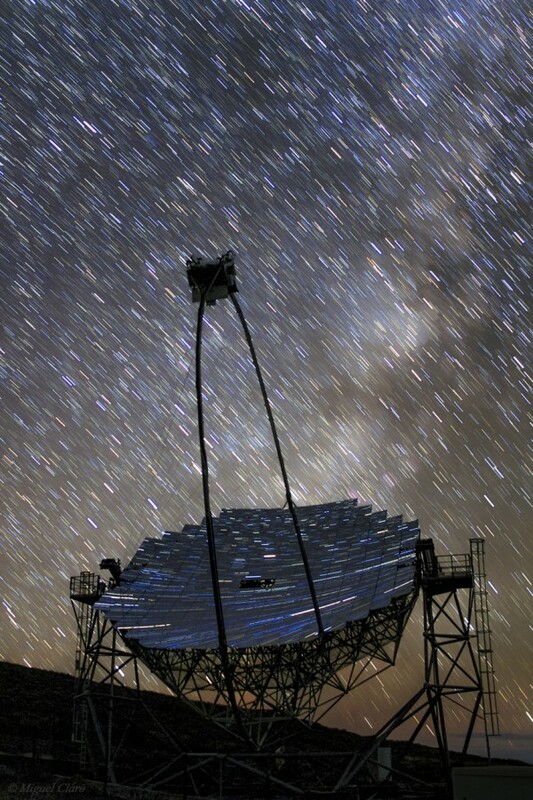 The MAGIC telescope can detect very high energy gamma rays in a range of energies where no other telescope in the world can operate, so it opens up a brand new window into the universe. 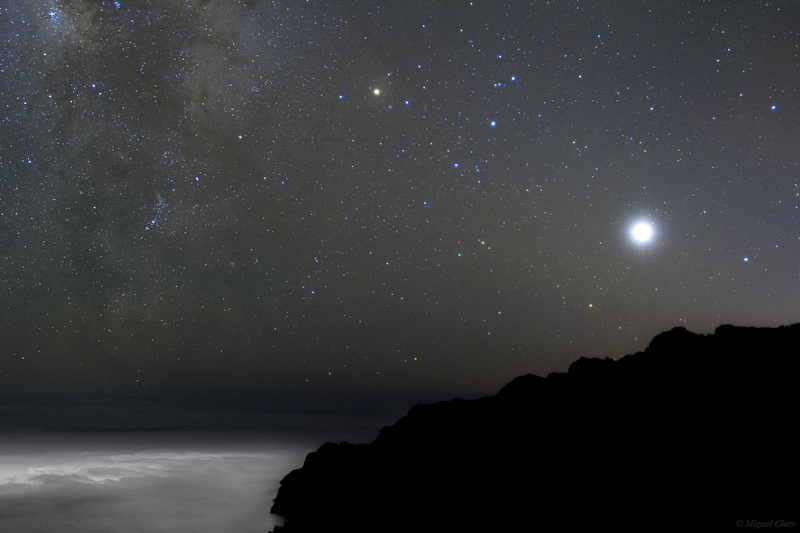 Above the horizon and clouds, at left, Jupiter is the brightest star shining in this view captured from Los Andenes, in the greatest night sky of La Palma, Canary island. In the center, lies the Rosette nebula. Above right, Orion Constellation shows besides the different color of each star, highlighted by orange Betelgeuse, we could see some deep sky objects like the Barnard´s Loop, and Lambda Orionis, was well near the “belt” stars, the Flame and Horsehead nebula, and below, the Runing Man nebula and the Great Orion Nebula with it´s impressive brightness. Other interesting object clearly visible in the image, is the NGC2175 the Monkey Head nebula, between the right center and corner of the image. To create the spikes in the star, was used a star filter in the front of the lens. In this colorful startrail, captured near the mountain top of the Roque de los Muchachos on the Canary island of La Palma, from left to right, we can see the Telescopio Nazionale Galileo (TNG), that is a 3.6m alt-azimuth telescope with a Ritchey-Chretien optical configuration and a flat tertiary mirror feeding two opposite Nasmyth foci and represents the largest Italian optical/infrared telescope. 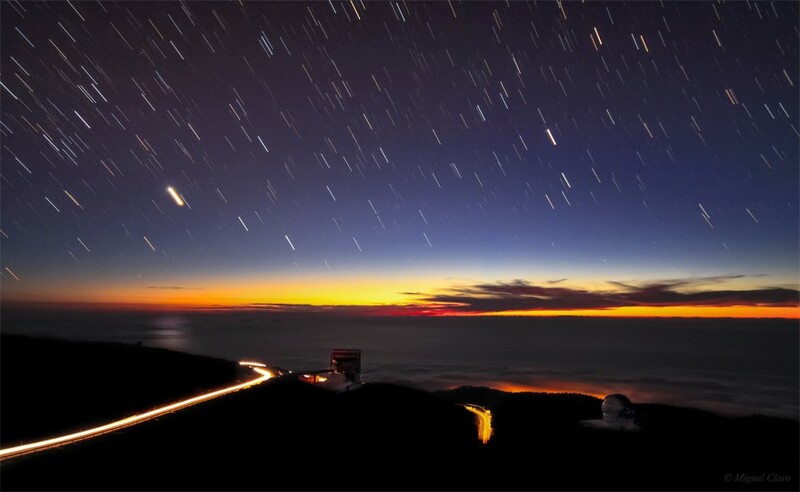 On the right edge of the picture – in the foreground – stands the Gran Telescope Canarias (GTC) with a 10,4 meters primary mirror reflecting telescope was designed to incorporate the most up-to-date technology and it is one of the most advanced telescopes in the world, actually, the largest one until now in the optical-infrared system. | Canon 50D – ISO2000; 35mm at f/2; Exp. 15 secs. Sum of 37 images taken in 01/10/2013 between 00:32 and 00:42. | Canon 60Da – ISO2500; 24mm at f/2; Exp. 15 secs. Sum of 53 images taken in 01/10/2013 at 00:22. In the foreground we can see the great MAGIC I telescope (Major Atmospheric Gamma-ray Imaging Cherenkov Telescopes) with it´s gigantic structure in front of a colorful startrail background, also mirrored on its impressive brilliant surface of 236 m2. 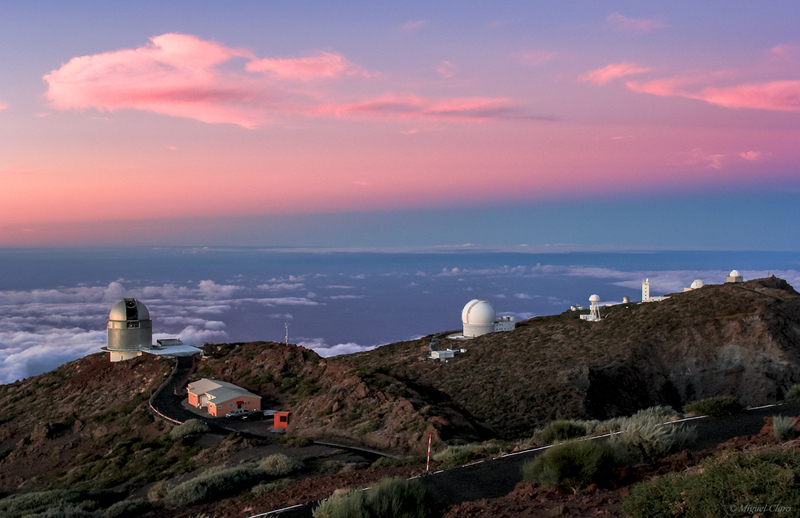 MAGIC is a system of two Imaging Atmospheric Cherenkov telescopes situated at the Roque de los Muchachos Observatory on La Palma, one of the Canary Islands, at about 2200 m above sea level. MAGIC detects particle showers released by gamma rays, using the Cherenkov radiation, i.e., faint light radiated by the charged particles in the showers. With a diameter of 17 meters and 236 m2 reflective surface, it was the largest in the world before the construction of H.E.S.S. II. MAGIC is not only huge, but also pioneers a number of technical developments that had never been applied to Cherenkov telescopes before. The mirror is extremely light and can be moved to any position in the sky in less than thirty seconds. It is made up of 270 individual mirror panels that can be independently focussed using an active mirror control system equipped with lasers. Below we can see the MAGIC with a sky full of “steady” stars (without trail), and lighted by the Milky Way presence in the background. 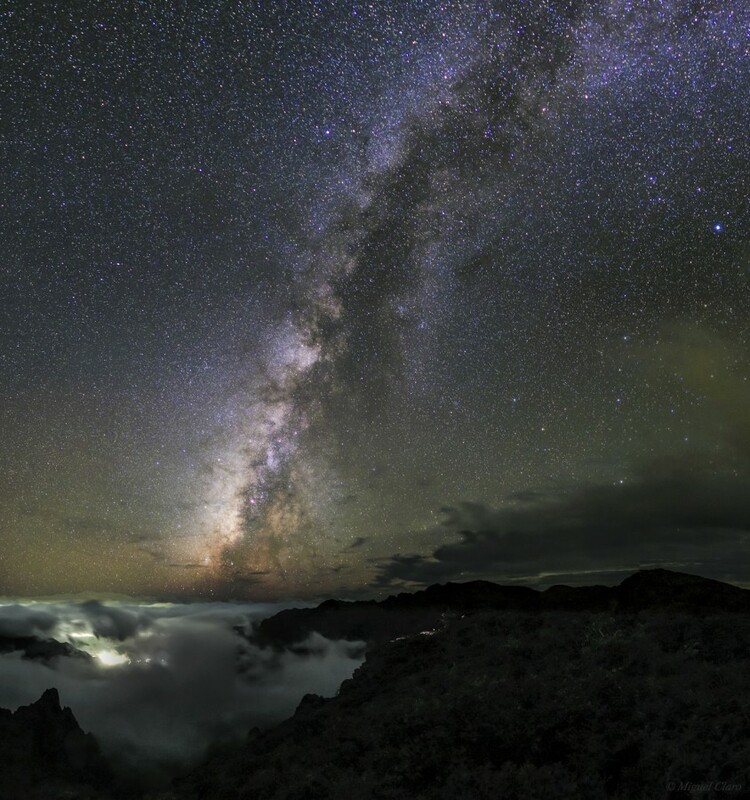 A panoramic view from Roque de Los Muchachos on the Canary island of La Palma, where stands a huge complex with 15 telescopes, some of the largest telescopes in the world – many of them visible in the background – from 19 nations, that are using the best night sky in Europe to explore the cosmos. 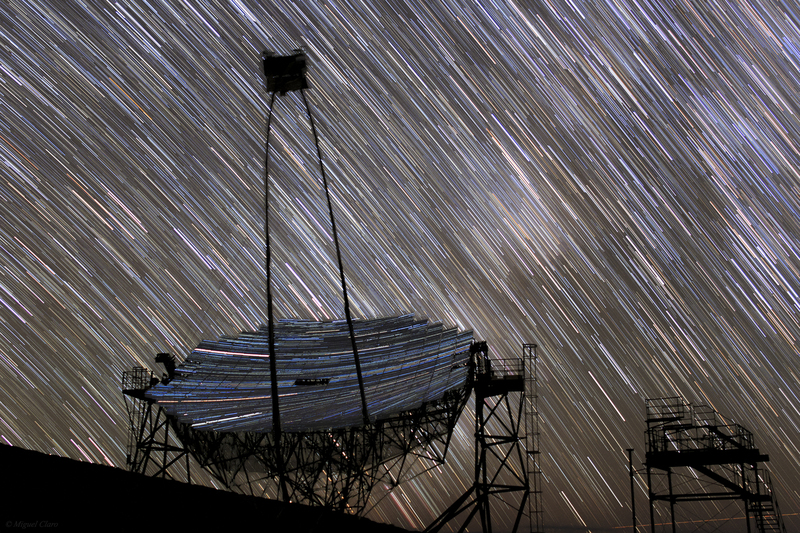 In the foreground – both edges of the image – stands the MAGIC telescope I and II (Major Atmospheric Gamma-ray Imaging Cherenkov Telescopes). MAGIC-II is located at a distance of 85 m from the first MAGIC telescope (at right). The stereo operation of both telescopes has increased the sensitivity of the observatory by a factor of ~3. MAGIC-II (at left) is a copy of the original MAGIC-I but it has a more homogeneous camera with more pixels, and a refurbished readout. In 2012, in a major upgrading operation mostly concerning MAGIC-I, the two telescopes were made technically identical. MAGIC is not only huge (it was the largest telescope mirror in the world, with 17 meters in diameter, before the construction of H.E.S.S.) but also pioneers a number of technical developments that had never been applied to Cherenkov telescopes before. The mirror is extremely light and can be moved to any position in the sky in less than thirty seconds. It is made up of 270 individual mirror panels that can be independently focussed using an active mirror control system equipped with lasers. 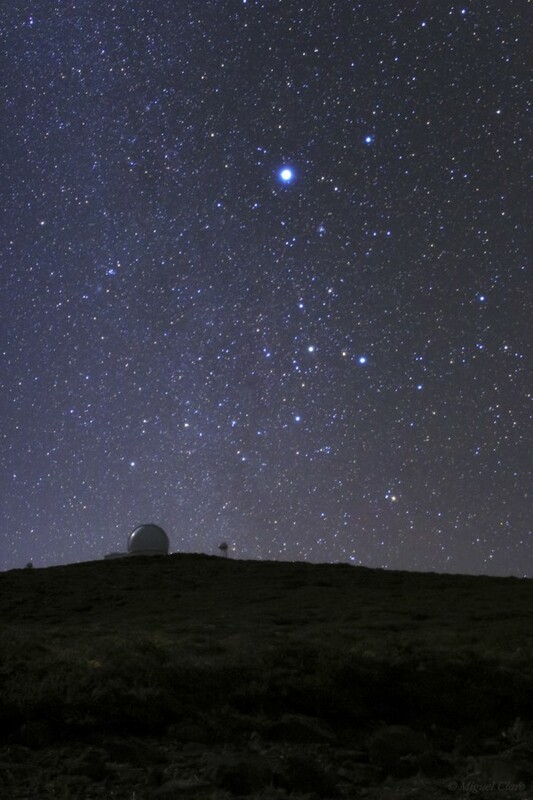 Between the both giant Cherenkov Telescopes, stands the mountain top of the Roque de los Muchachos, where is placed from right to left, telescopes like Gran Telescopio Canarias (GTC), with a 10,4 meters primary mirror reflecting telescope (first silhouette), Telescopio Nazionale Galileo (TNG), that is a 3.6m alt-azimuth telescope with a Ritchey-Chretien optical configuration, Nordic Optical Telescope (NOT) a modern 2.6-m optical/IR telescope, Dutch Open Telescope (DOT) an innovative optical telescope with a primary mirror of 45 cm diameter, for high-resolution imaging of the solar atmosphere, Swedish 1-m Solar Telescope (SST) is the largest solar telescope in Europe and number one in the world when it comes to high spatial resolution, and finally the great William Herschel Telescope (WHT), the largest optical telescope of its kind in Europe, with a primary mirror of 4.2 meters in diameter, is one of the most scientifically productive telescopes in the world. Between the William Herschel Telescope and the MAGIC (at left) the sky shows the Pleiades star cluster M45, and a bit above, semi hidden behind the antenna we can find the deep sky object California nebula NGC1499. From left to right edge, the sky shows the presence of a strong green airglow of oxygen atoms (90-100 km high), and shining in the center image as an orange bands – normally from oxygen atoms at 150-300km high where the atmosphere is so sparse and collisions so infrequent that the atoms have time to radiate ‘forbidden’ light. Finally, against the MAGIC I (in the right corner of the picture), lies our own Galaxy, the Milky Way. In the foreground we can see the great MAGIC I telescope (Major Atmospheric Gamma-ray Imaging Cherenkov Telescopes) with it´s gigantic structure in front of a starry background, also mirrored on its impressive brilliant surface of 236 m2. 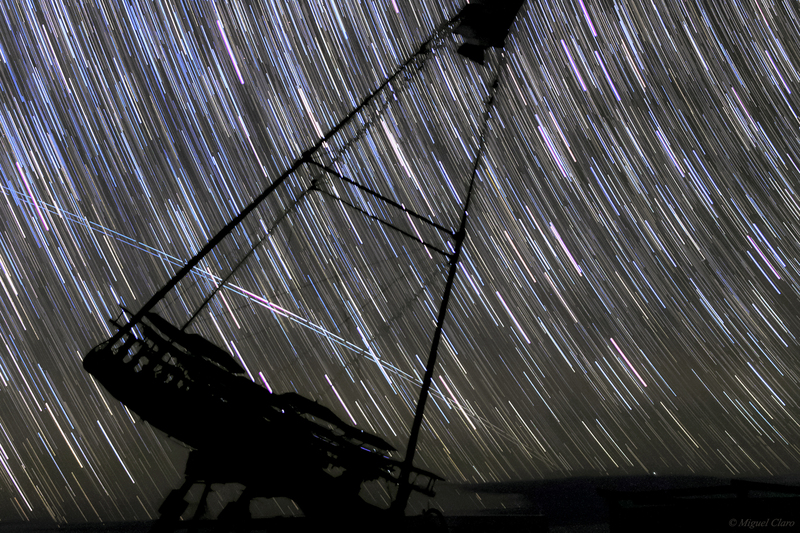 In the foreground we can see the profile of MAGIC I telescope (Major Atmospheric Gamma-ray Imaging Cherenkov Telescopes) with it´s gigantic structure in front a startrail background, where is also visible the Milky Way dragged, and clearly distinguishable the different colors of each star and the deep sky objects, as viewed in the violet paths in the center of the picture. From lower left to the right side of the picture, we can see the silver dome open of Gran Telescopio Canarias (GTC), with a 10,4 meters primary mirror reflecting telescope. 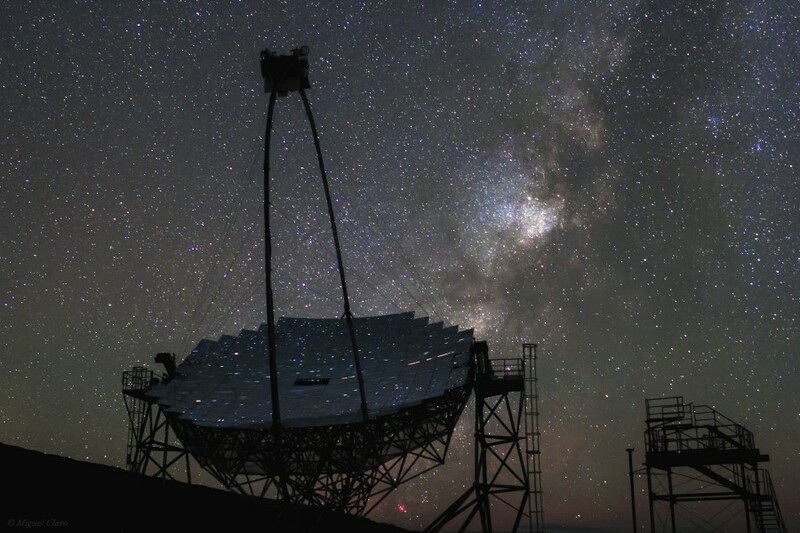 It is designed to incorporate the most up-to-date technology and it is one of the most advanced telescopes in the world, actually, the largest one until now in the optical-infrared system. At right edge, in the background, we can see the beautiful light coming from the central region of the “vertical” Milky Way, where the main stars of Sagittarius constellation are shining surrounded by a region rich in emission nebulae, like the Lagoon Nebula (M8) and the Trifid Nebula (M20), or even M23 and M24, – seen in the top right corner of the picture. Behind the GTC dome, the sky is smoothly shining as an orange airglow, normally from oxygen atoms at 150-300km high where the atmosphere is so sparse and collisions so infrequent that the atoms have time to radiate ‘forbidden’ light. The image was taken in Observatorio del Roque de los Muchachos (ORM) situated on the edge of the Caldera de Taburiente National Park, 2.400 m. above sea level, on the island of La Palma, Canarias, Spain. It is home to one of the most extensive fleets of telescopes to be found anywhere in the world, and where 15 telescopes from 19 nations use the best night sky in Europe to explore the cosmos. 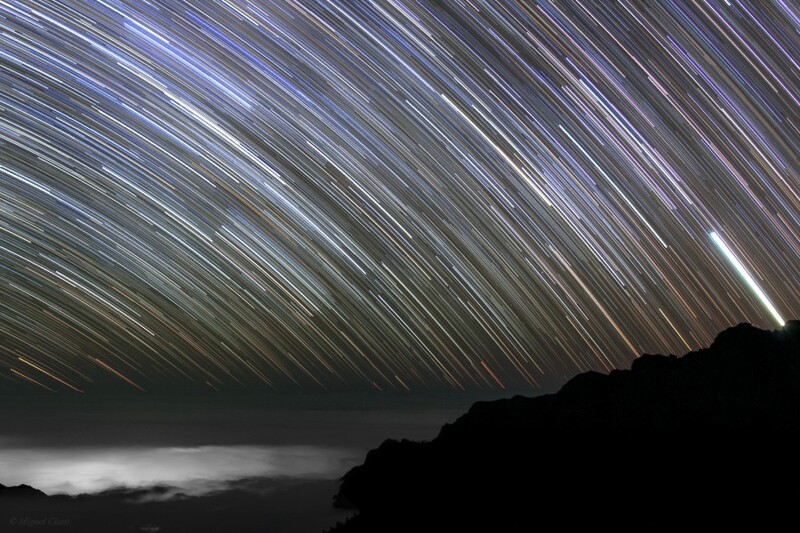 In this colorful startrail captured facing to northwest region, we could see behind FACT Telescope silhouette, the trail of a double satellite flyby, possibly related to the Naval Ocean Surveillance System (NOSS) satellite formation, each having two or three satellites in close proximity to one another. Normally these satellites are relatively dim to the unaided eye, but on occasion they brighten sufficiently to be easily seen in a dark sky, like occured in the sky of Roque de Los Muchahos observatory, in La Palma, Canary Island. Below is the MAGIC against a startrail background where is also visible the Milky Way dragged, and clearly distinguishable the different colors of each star. Captured in the Observatorio del Roque de los Muchachos (ORM), situated on the edge of the Caldera de Taburiente National Park, 2.400 m. above sea level, on the island of La Palma, Canary, Spain, the image shows in the foreground, the First G-APD Cherenkov Telescope (FACT), that is the first imaging atmospheric Cherenkov telescope using Geiger-mode avalanche photodiods (G-APDs) as photo sensors. The rather small, low-cost telescope will not only serve as a test bench for this technology in Cherenkov astronomy, but also monitor bright active galactic nuclei (AGN) in the TeV energy range. The First G-APD Cherenkov Telescope is assembled in Roque de Los Muchachos on the MAGIC site, mounted in the focus of one of the former HEGRA telescopes (CT3). In the background, the beautiful light coming from the central region of Milky Way, where the main stars of Sagittarius constellation are shining behind the telescope structure and surrounded by a region rich in emission nebulae, like the Lagoon Nebula (M8) and the Trifid Nebula (M20), or even M23 and M24, Omega nebula (M17) and Eagle Nebula (M16) – seen in the right edge of the picture in violet color – working as an impressive backlight that even without the presence of any other source of light, allow us to show the imposing dark silhouette of the FACT Telescope, with some of these nebulae and stars, reflected in part of the 9.5 sqm mirror area. More info related: DWARF – Dedicated multiWavelength Agn Research Facility. 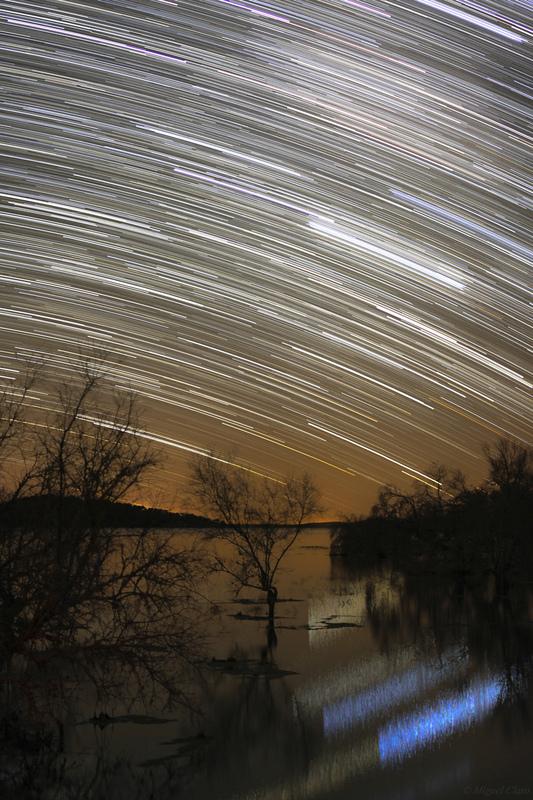 Image of a startrail sequence taken at the same time of the image below, with the Milky Way dragged in the background. The excellent quality of the sky for astronomy in the Canaries is determined and protected by Law. 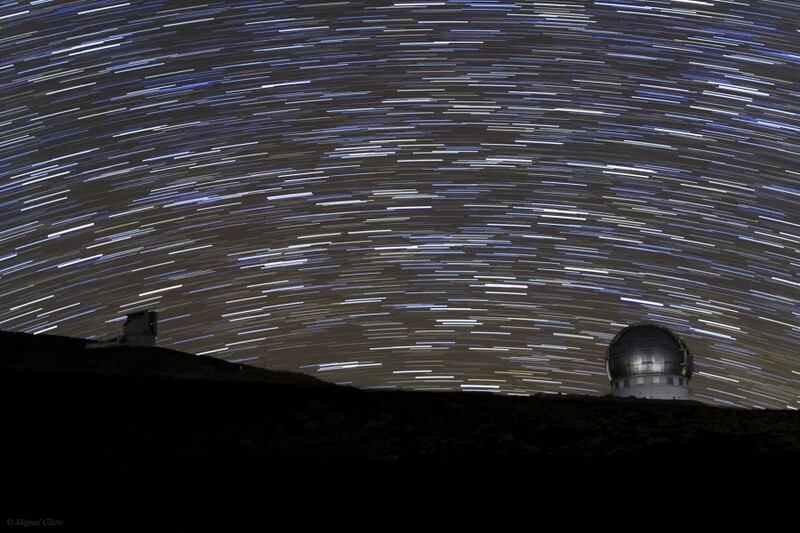 As a result, the observatories of the Instituto de Astrofísica de Canarias (IAC) are an “astronomy reserve” which has been available to the international community since 1979. 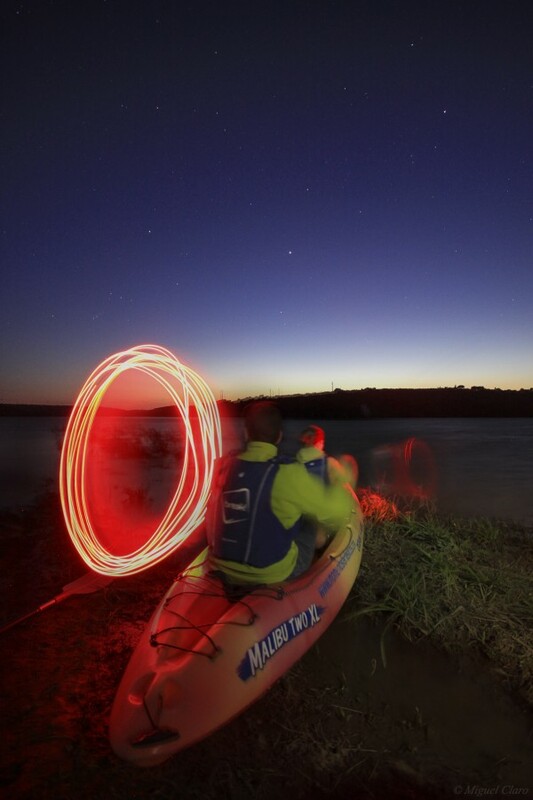 Technical image details: Canon 60D – ISO2500; 24mm at f/4; Exp. 1/80 secs. in 30/09/2013 at: 22h43. 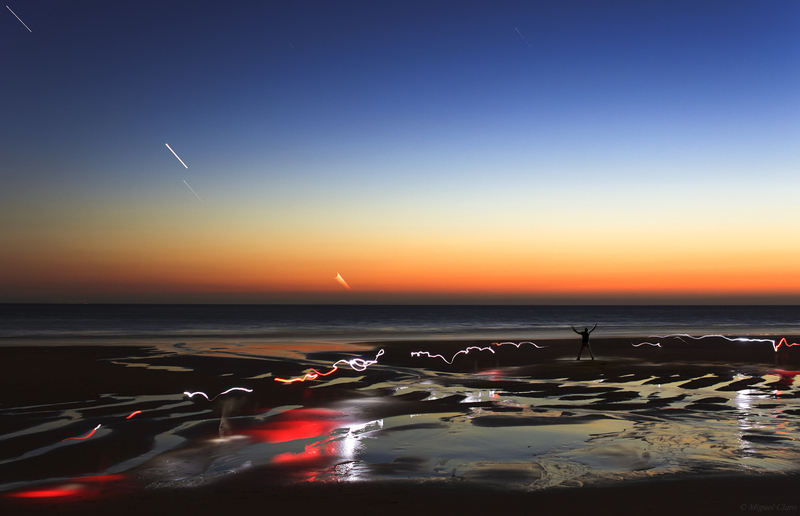 | Canon 50D – ISO1600; 13mm at f/5; Exp. 30 secs. Sum of 14 images taken in 30/09/2013 between 20:59 and 21:06. In this picture captured few minutes after the sunset from Roque de Los Muchachos, in La Palma Canary Island, we can see the Earth shadow, a dark blue band that rises upwards from the horizon. The band is the shadow of the Earth on the atmosphere. 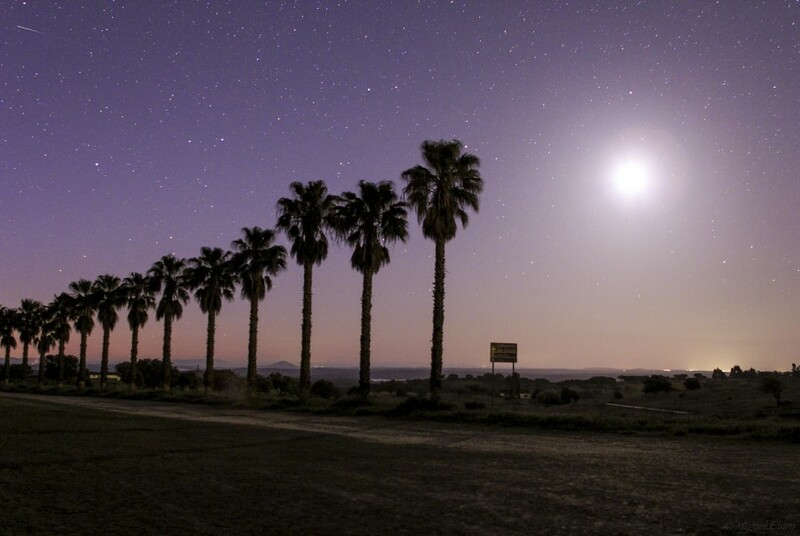 Immediately above, where the evening air is still lit, glows a pink band called the anti-twilight arch, or “Belt of Venus”. 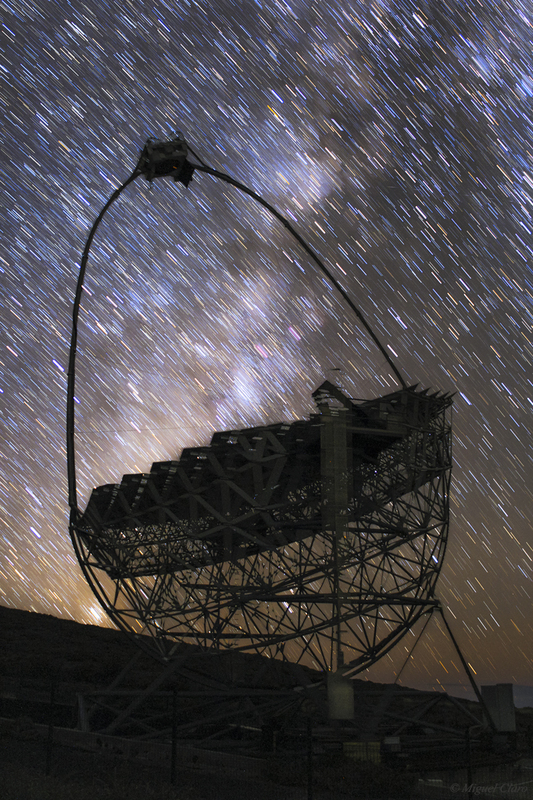 On Earth, stands part of a huge complex with 15 telescopes, some of the largest telescopes in the world. From left to right, the grey dome open is the shelter for the Nordic Optical Telescope (NOT) a modern 2.6-m optical/IR telescope, next, the small white house is the home for Automatic Transit Circle (ATC), an old meridian circle built by Grubb-Parsons in 1950 but completely refurbished and automatized in the 70’s of the past century by the Copenhagen University Observatory (CUO). It main task is to observe evenly bodies at their transit across the meridian. At his right, the big white dome belongs to the great William Herschel Telescope (WHT), the largest optical telescope of its kind in Europe, with a primary mirror of 4.2 meters in diameter, is one of the most scientifically productive telescopes in the world. Next, the small shape in the background near the first white tower is from Liverpool Telescope, a 2 meter diameter optical astronomical telescope, constructed especially for robotic use. 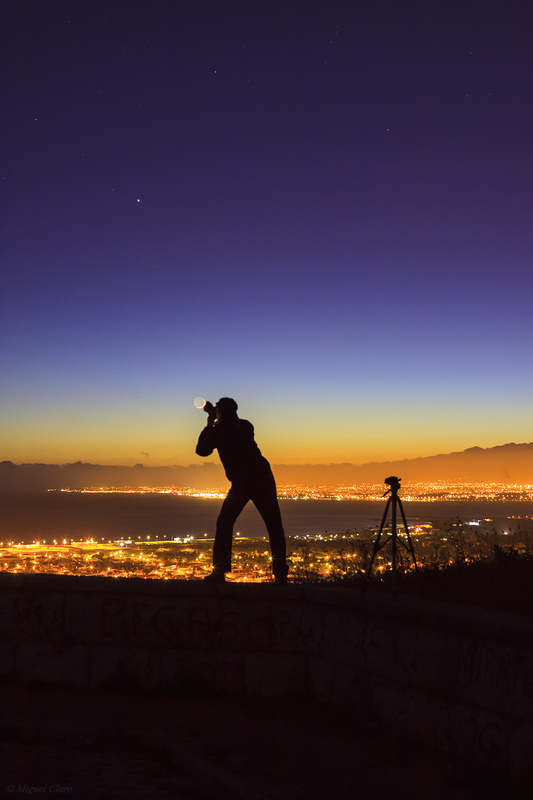 The telescope is especially to study variable astronomical phenomena. Now, the first white Tower is from Dutch Open Telescope (DOT) an innovative optical telescope with a primary mirror of 45 cm diameter, for high-resolution imaging of the solar atmosphere. Next far, the silver small dome is from Mercator Telescope, a 1.2 m quasi-robotic telescope which scientific niche is focussed on monitoring variable celestial phenomena with a large range in typical time-scales (pulsating stars, gravitational lenses, Gamma Ray Bursts, active Galactic Nuclei), immediately adjacent to the next tower (just in the picture) we can see the Swedish 1-m Solar Telescope (SST), the largest solar telescope in Europe and number one in the world when it comes to high spatial resolution. The last white domes belongs to Isaac Newton Telescope (INT) with a 2.54-meter primary mirror and the Jacobus Kapteyn Telescope (JKT) with a parabolic primary mirror of 1.0 m diameter. A panoramic view from the top of El Roque de Los Muchachos, in La Palma Canary island, where stands a huge complex with 15 telescopes, some of the largest telescopes in the world – many of them visible in the background – from 19 nations, that are using the best night sky in Europe to explore the cosmos. The main telescopes visible in the image, are, from left to right: Telescopio Nazionale Galileo (TNG), Gran Telescopio Canarias (GTC), The MAGIC I and IItelescopes (Major Atmospheric Gamma-ray Imaging Cherenkov Telescopes) as seen below in the center of the image, Nordic Optical Telescope (NOT) with the silver dome, and William Herschel Telescope (WHT) the biggest white dome in the picture. A panoramic view with the mountain of Roque de Los Muchachos, in La Palma Canary island, where stands a huge complex with 15 telescopes, some of the largest telescopes in the world – many of them visible in the background – from 19 nations, that are using the best night sky in Europe to explore the cosmos. From Right to Left we can see the Gran Telescopio Canarias (GTC), The MAGIC I and II telescopes (Major Atmospheric Gamma-ray Imaging Cherenkov Telescopes), Telescopio Nazionale Galileo (TNG), Nordic Optical Telescope (NOT), Dutch Open Telescope (DOT), Swedish 1-m Solar Telescope (SST) , William Herschel Telescope (WHT), Mercator Telescope, Jacobus Kapteyn Telescope (JKT) and Isaac Newton Telescope (INT). 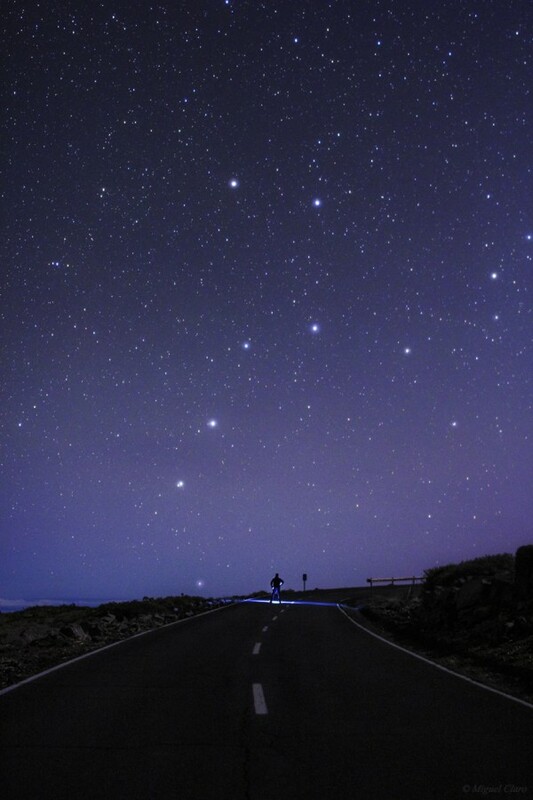 The Big Dipper (Ursa Major) lies in the “end” of the road to Roque de Los Muchachos, where a stargazer is enjoying the great sky of La Palma. The excellent quality of the sky for astronomy in the Canaries is determined and protected by Law. 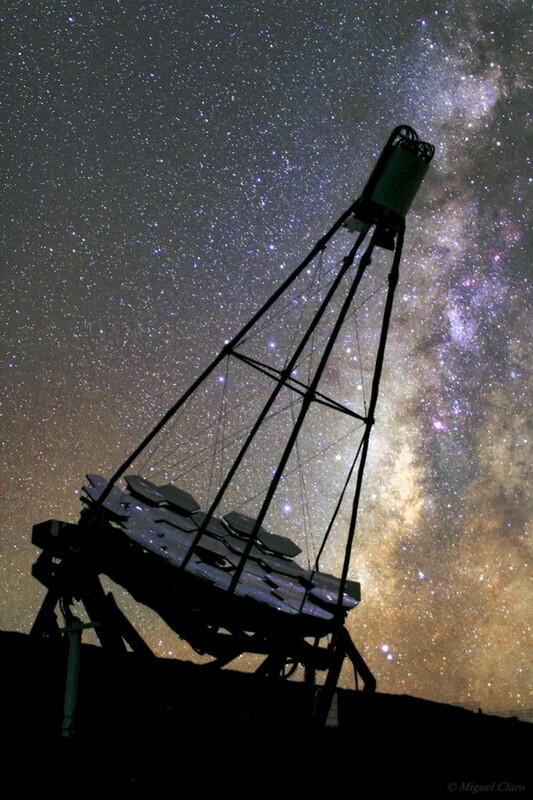 As a result, the observatories of the Instituto de Astrofísica de Canarias (IAC) are an “astronomy reserve” which has been available to the international community since 1979. I´ve used a diffuse filter in the camera lens, to increase and highlight the main stars of Ursa Major. Sirius shining in the Canis Major constellation seen above the William Herschel Telescope (WHT), the largest optical telescope of its kind in Europe, with a primary mirror of diameter 4.2 meters. 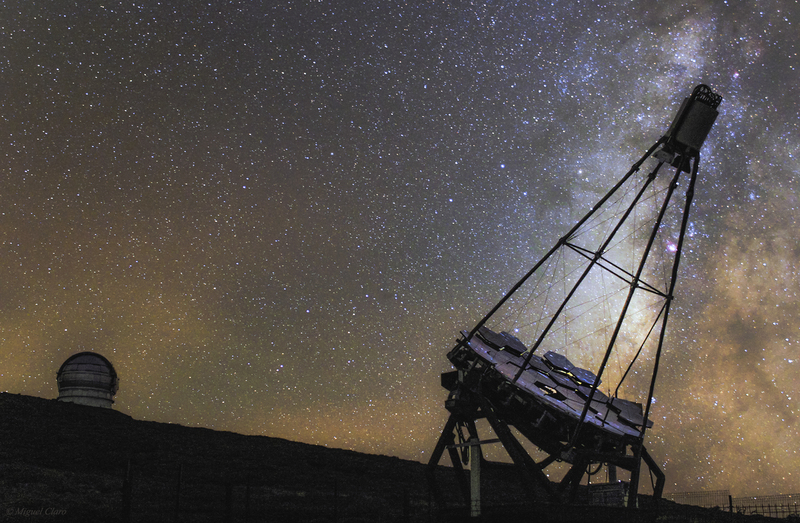 Its versatile and state-of-the-art instrumentation together with the superb sky quality of the Roque de Los Muchachos, the Observatory have made the WHT one of the most scientifically productive telescopes in the world. 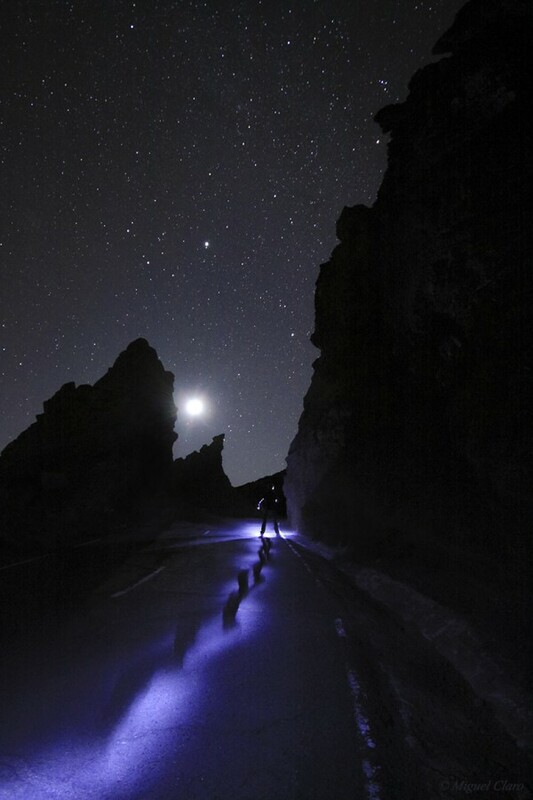 This “UFO” view of the Moon above the rocks between Los Andenes and Roque de Los Muchachos, in La Palma Canary island, shows a stargazer that seems to come down from another planet. Above the moon – In the middle of the sky – the brightest star is actually the planet Jupiter that is in conjunction with the star Wasat, from Gemini constellation. The brightest star in the right top corner of the image, is Betelgeuse, from Orion constellation. 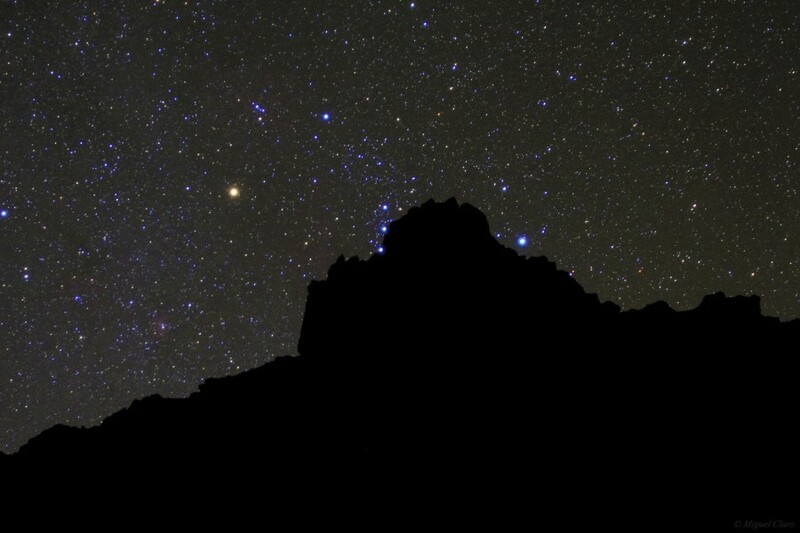 Orion Constellation behind a great rock from Los Andenes, near Roque de Los Muchahos, La Palma. Besides the different color of each star well visible in the picture, we could see some deep sky objects like part of the Barnard´s Loop, Lambda Orionis, or low left and above the rocks, the Rosette nebula. In this deep sky wide field view of our own galaxy, the Milky Way arm is showed as it as seen and captured from the northern hemisphere of Earth. A first look along the panorama, shows us the hazy band of white light originated from un-resolved stars and other material that lie within the Galactic plane, contrasting with the Dark regions within the band, corresponding to areas where light from distant stars is blocked by interstellar dust. See below the annotated version. 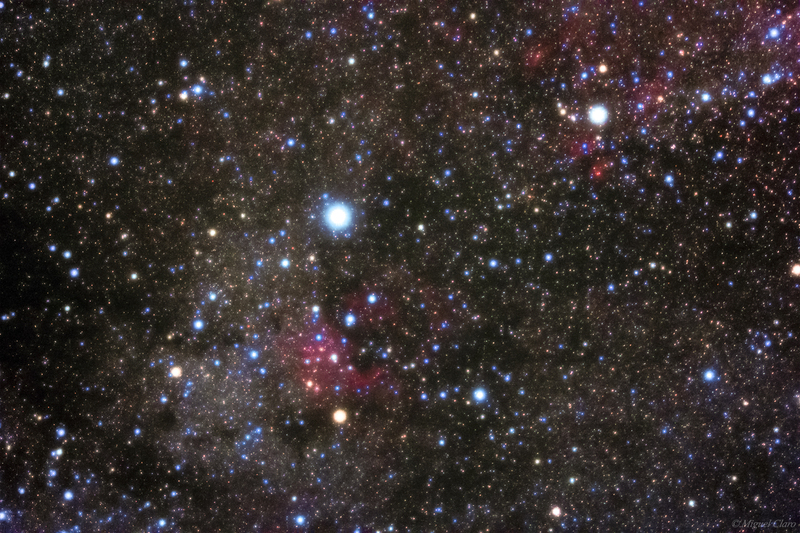 In detail – from left to right – We see part of Aquila constellation with the main visible star Altair and below it, the “E” Dark nebula (B142 e B143). Beside the small Delphinus constellation, we can find the great Cygnus, home for a lot of emission nebulae, like de Sadr region or IC1318. Above Deneb star, we find the Pelican Nebula (also known as IC 5070 and IC 5067) is an H II region associated with the North America Nebula (NGC7000) an emission nebula with a remarkable shape that resembles the North America continent. Above right, the Cocoon nebula (IC 5146) is a reflection/emission nebula and Caldwell object, yet in the constellation of Cygnus. In the center picture, right of Cygnus lies the Cepheus constellation and the IC1396 nebula, also called the “Elephant’s Trunk Nebula”, is one of the largest emission nebulae in the Northern Sky with a diameter of 3 degrees. It is a giant cloud of gas and dust at a distance of 2400 light years from Earth. Next Cepheus is the Cassiopeia constellation and below right, stands The Heart Nebula, IC 1805 an emission nebula of about 7500 light years away from Earth. At his side, lies the “Soul Nebula”. In line with Cassiopeia at the top of the picture, stands de great Andromeda Galaxy M31, a spiral galaxy approximately 2.5 million light-years from Earth. Few degrees to right we can find the open cluster NGC752 about 1,300 light-years away from us. The cluster was discovered by Caroline Herschel in 1783, and cataloged by her brother William Herschel in 1786. Between Cassiopeia and Perseus constellation, shines the Double Cluster, common name for the naked-eye open clusters NGC 869 and NGC 884, both lie at a distance of 7500 light years. Also in the Perseus constellation, we can find another great emission nebula, The “California Nebula” (NGC 1499). It lies at a distance of about 1,000 light years from our planet. Finally, at the right edge of this Milky Way panorama, we can find the Auriga constellation, with it´s brightest star Capella. This constellation also sustains another deep sky object called: The “Flaming Star Nebula” (IC 405), an emission/reflection nebula that lies about 1,500 light-years away. Above Auriga, stands the Taurus constellation, with the shining star Aldebaran, and at his left, the great open star cluster Pleiades M45 (also known as Seven Sisters), containing middle-aged hot B-type stars. It is among the nearest star clusters to Earth and is the cluster most obvious to the naked eye, in the night sky. The cluster is dominated by hot blue and extremely luminous stars that have formed within the last 100 million years. Dust that forms a faint reflection nebulosity around the brightest stars, was thought at first, to be left over from the formation of the cluster, but is now known to be an unrelated dust cloud in the interstellar medium, through which the stars are currently passing. The Pleiades are a prominent sight in winter in both the Northern Hemisphere and Southern Hemisphere, and have been known since antiquity to cultures all around the world, including the Māori, Aboriginal Australians, the Persians, the Chinese, the Japanese, the Maya, the Aztec, and the Sioux and Cherokee. The picture was taken in Los Andenes, near Roque de Los Muchahos, in La Palma, Canary Island, where stands a huge complex with the some of the largest telescopes in the world. 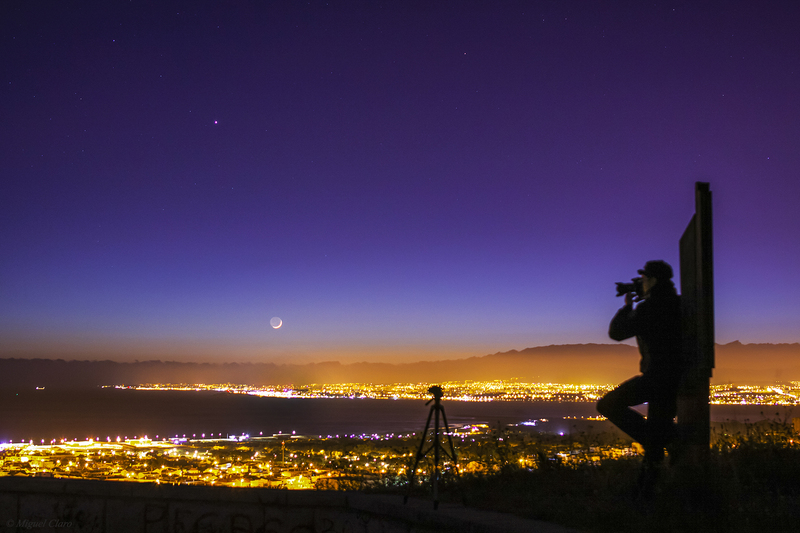 The excellent quality of the sky for astronomy in the Canaries is determined and protected by Law making it one of the best night skies in the world. Canon 60Da – ISO 1250; Exp. 60 sec. 35mm lens at f/2. Mosaic of 18 images traking with Vixen Polarie travel mount. Below you will find a resume with all publications – printed and online – related to this particular photograph. Please refer the i-frame above, generated automatically from the overview page Press. 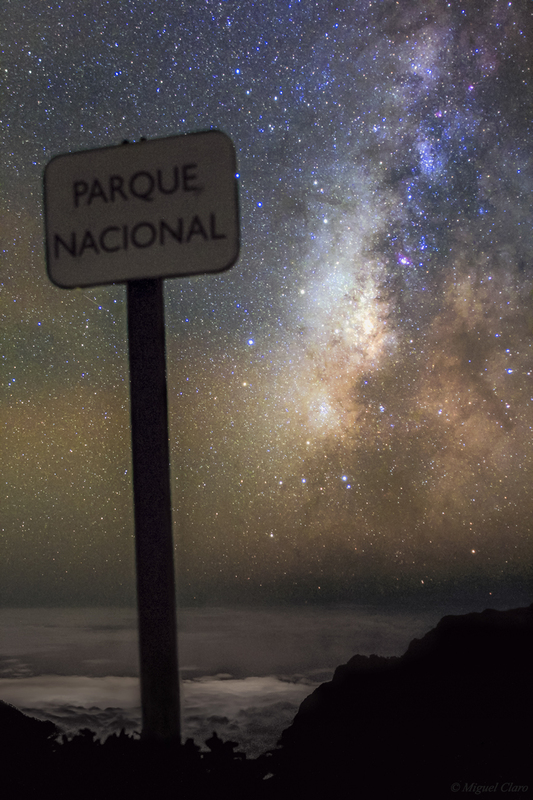 The central region of the Milky Way full of gas and dust, emission nebulae and so many stars, as viewed from Los Andenes, a region inside “Parque Nacional de la Caldera de Taburiente”, as we could see mentioned in the signpost on the National Park. Below, the Caldera is full of low clouds. In this Starry sky full of trails we can see the different colors of each star, many of them from the Scorpius constellation, The strong path at the right side of the image, comes from the planet Venus. Below the horizon, we found an ocean of clouds, located inside the Caldera and blocking part of the small light pollution coming from Santa Cruz de La Palma. The rocky silhouette is part of Roque de Los Muchachos, where stands a huge complex with the some of the largest telescopes in the world. | Canon 60Da – ISO1600; 24mm at f/2; Exp. 13 secs. Sum of 200 images taken in 29/09/2013 between 21:22 and 22:06. 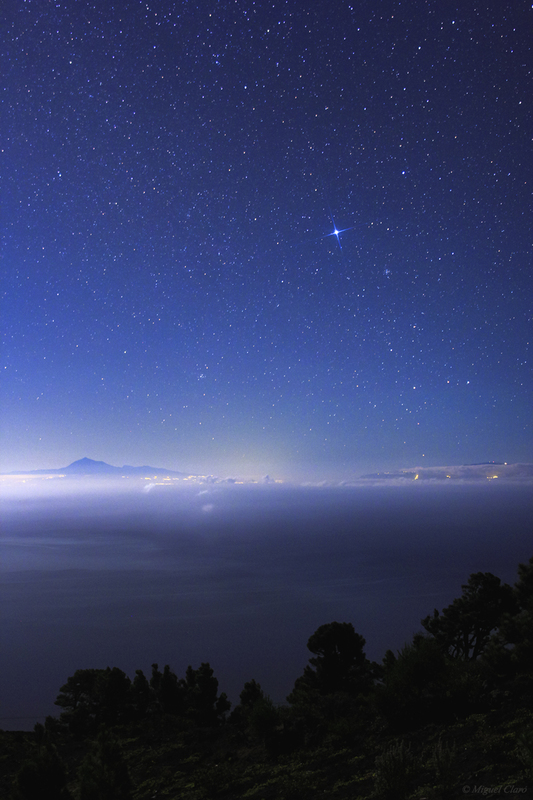 The Nautical Twilight seen from Los Andenes, near Roque de Los Muchahos, in La Palma, where we could see the strong light of planet Venus (the strongest light in the picture) inside the stellar asterism with a trapezium shape, that forms the Libra constellation. In the same imaginary line which conects Venus to the Zubenelgenubi star, we can find the planet Saturn, the third brightest object in the picture (at the right side of the image) almost with the same brightness of Antares, from Scorpius constellation, visible in the top of the picture as an orange star. Below the horizon, we found an ocean of clouds, located inside the Caldera. The rocky silhouette is part of Roque de Los Muchachos, where stands a huge complex with the some of the largest telescopes in the world. 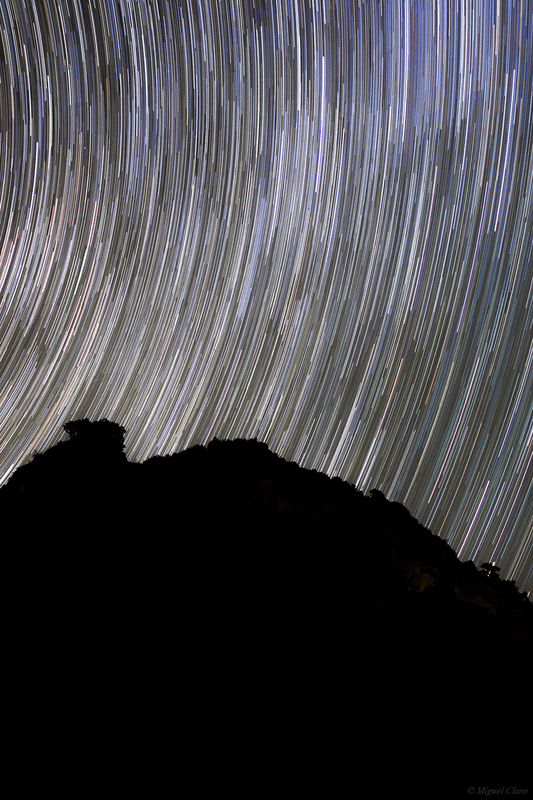 In this mosaic of 25 images, we can see the rocky silhouette between Los Andenes and Roque de Los Muchachos, where is the home to one of the most extensive fleets of telescopes to be found anywhere in the world, and where 15 telescopes from 19 nations are using the best night sky in Europe to explore the cosmos. 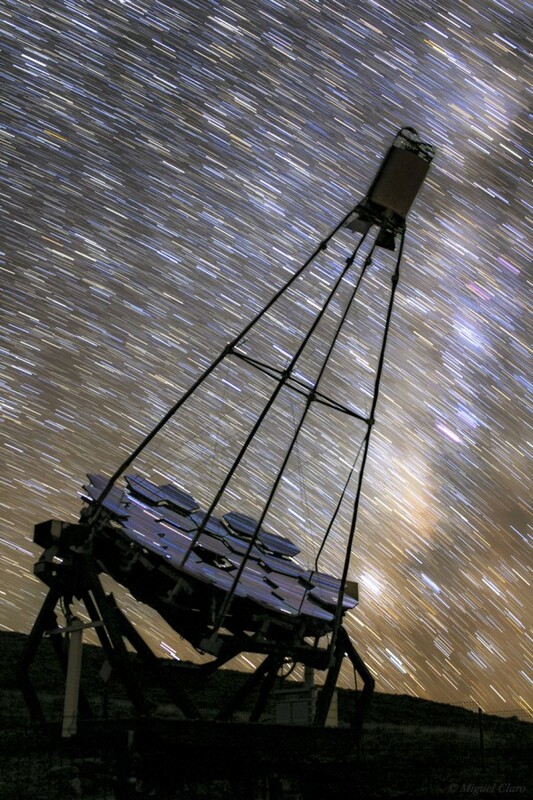 The William Herschel Telescope (WHT) is one of them, with a primary mirror of diameter 4.2 meters, the telescope can be seen below right in the picture, with is dome opened, seems to pointing to the triangle formed in the middle of the picture by the smooth band of Zodiacal light (at left) which is crossing the Milky Way smooth region (at right), below the Orion constellation. These smooth bands are also important to let us find objects, like M44 above the rocks, and following the zodical light we find the planet Jupiter, the brightest star in the image. In the middle of Milky Way band, we can find the Rosette nebula. The Moon is shining in Cancer constellation, behind the rocks and below right to the star cluster M44 (NGC2632), so creating a blueish glow – more strong and evident – in the left half part of the picture. | Mosaico – Canon 60Da – ISO2500; 24mm at f/2; Exp. 15 secs. in 30/09/2013 at: 05h50 AM Mosiac of 25 images. 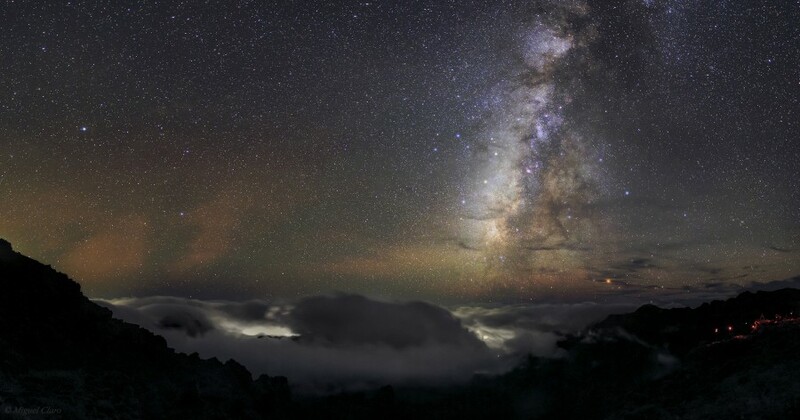 In this mosaic image, captured in a height of 2,200 meters from the sea level, and above the clouds, we can see part of the Milky Way arc with a the central region rich in gas and emission nebulae. 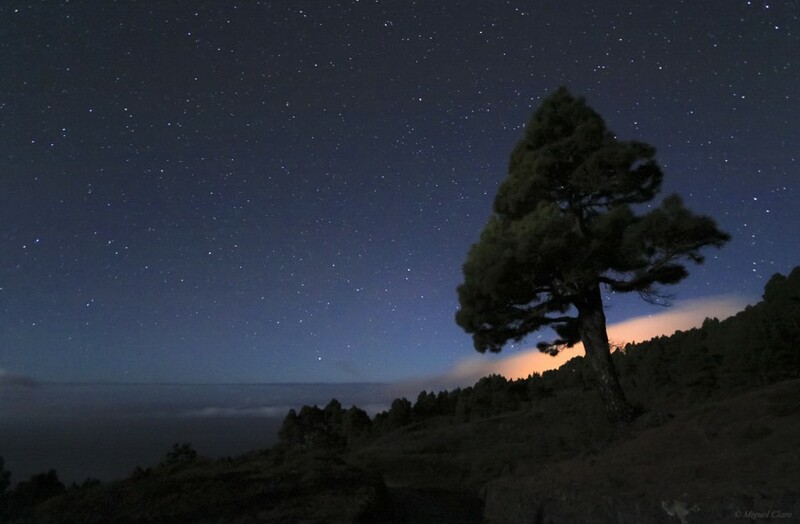 Near the horizon is Caldera de Taburiente – a very large volcanic crater with about 10 km across – that is full with clouds covering the city lights coming from La Palma. 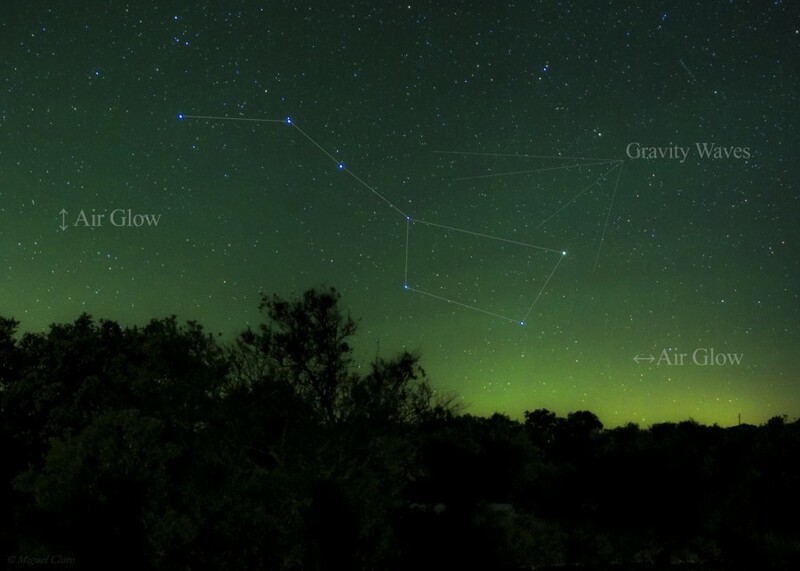 In the image is also visible some soft green airglow. The picture was taken in Pico de La Cruz, La Palma, Canary Island. The excellent quality of the sky for astronomy in the Canaries is determined and protected by Law. | Canon 60Da – ISO2000; 24mm at f/2; Exp. 20 secs. in 26/09/2013 at: 23h37 Mosaic of 23 images. 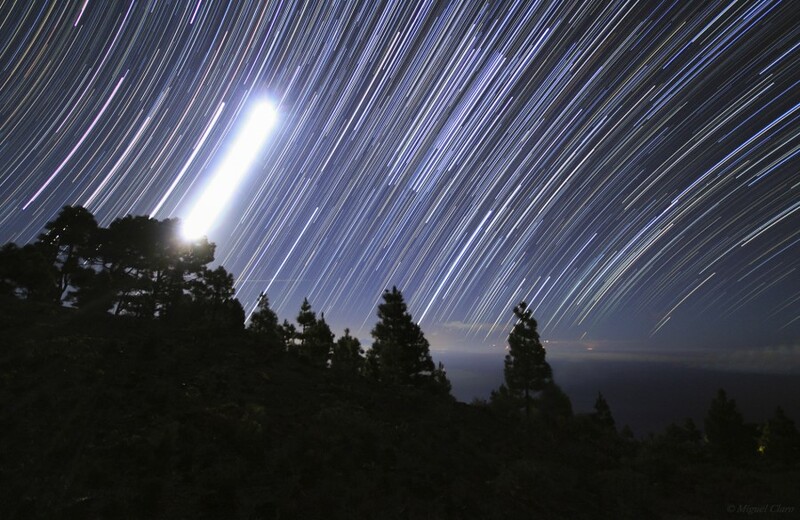 In this startrail and moontrail captured in Los Canarios, Fuencaliente, Canary island, above the landscape full of pine trees, the strong path of moon shines side-by-side with planet Jupiter (the trail above moon), as well as the trails from Orion stars, Canis Major and Columba, near the cloudy horizon. 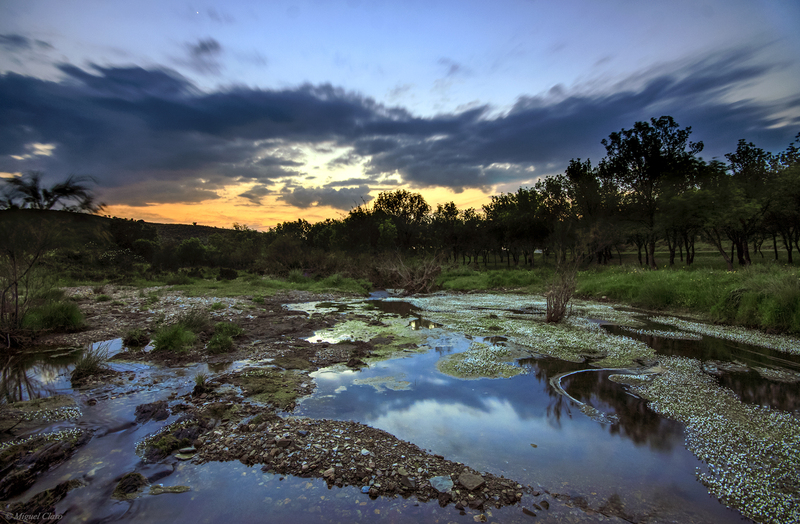 Canon 50D – ISO3200; 10mm at f/4; Exp. 30 secs. Sum 155 images taken in 28/09/2013 between: 3h19 AM and 4h43 AM. 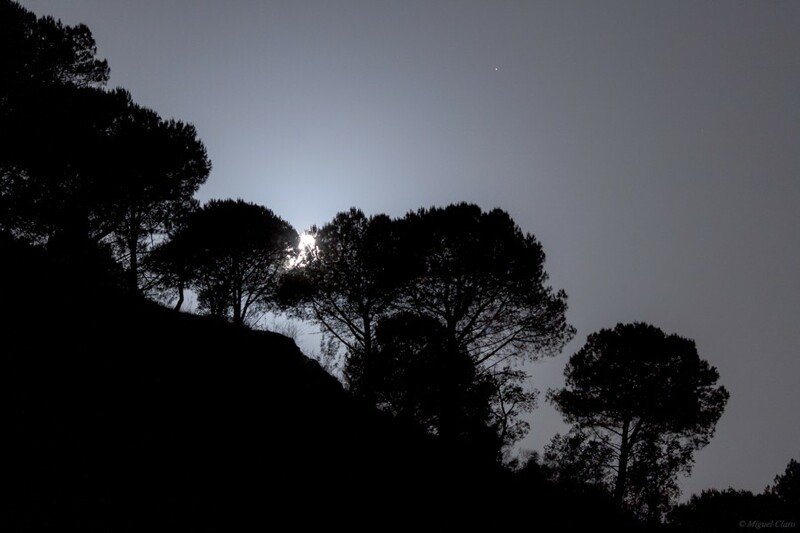 A lovely moonlite scene captured in La Palma moutains, in Los Canarios, Fuencaliente, facing to the Atlantic Ocean. While Sirius, the brightest star in the northen hemisphere is shining blue and strong in the morning sky, the Teide volcano seems to emerge from the clouds in the horizon, with 3718 km is the highest point above sea level in the islands of the Atlantic Ocean and the world’s third largest volcano. In the image, is also visible the entire constellation of Canis Major, and below right the Sirius, is clearly visible the star cluster M41. 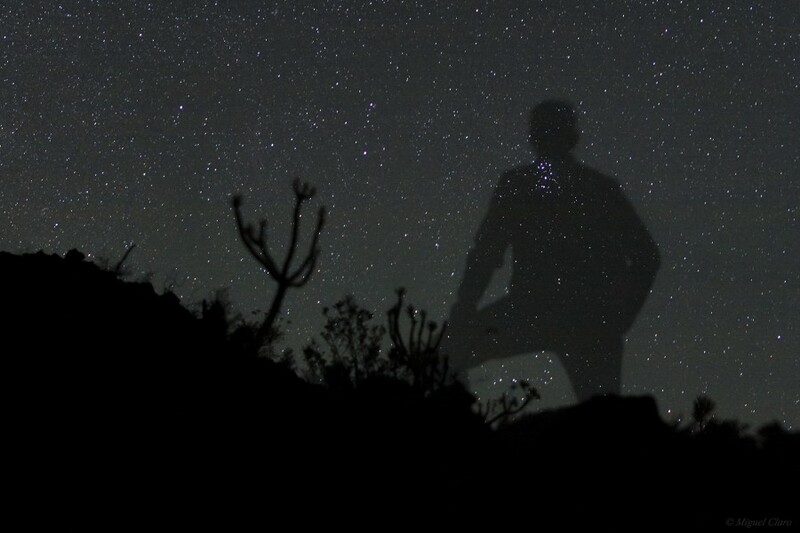 It could be the silhouette of a being from other Universe watching us on Earth, but actually is my own shadow, captured during only part of the photo exposure. Near my neck region, it´s visible the star cluster M45, Pleaides, from Taurus constellation. At my right shadow shoulder (left area of the image) , we can see the stars from Perseus, and with attention, is softly visible the California nebula NGC1499. 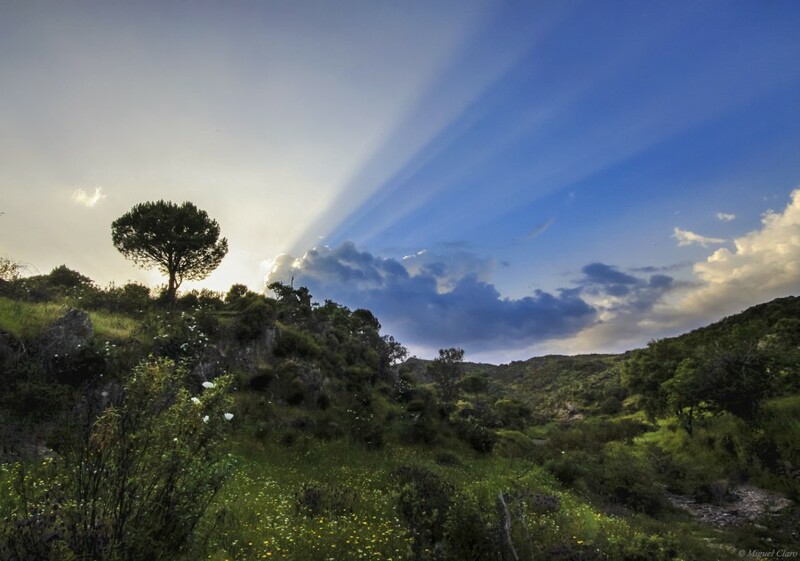 On earth we can see the silhouette of typical vegetation from Los Canarios, Fuencaliente, La Palma Canary island. 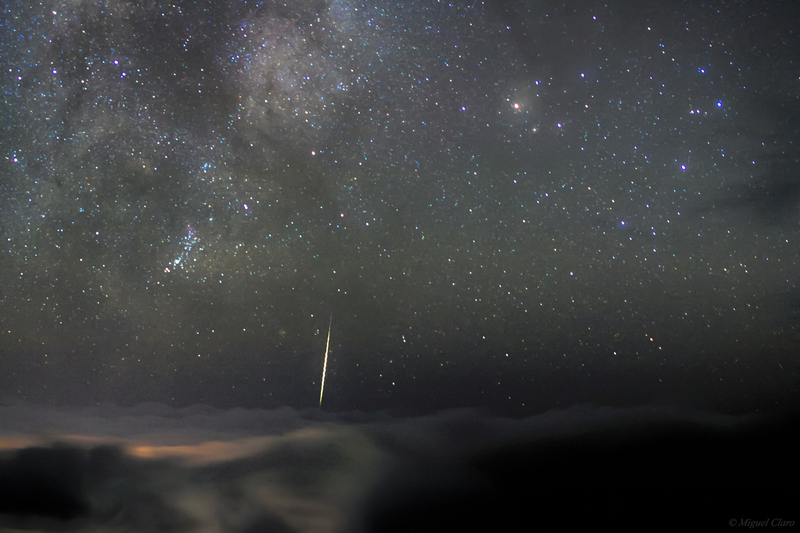 In this mosaic image, captured in a height of 2,200 meters from the sea level, and above the clouds, we can see the central region of the Milky Way with Sagittarius constellation surrounded by a region rich in emission nebulae. 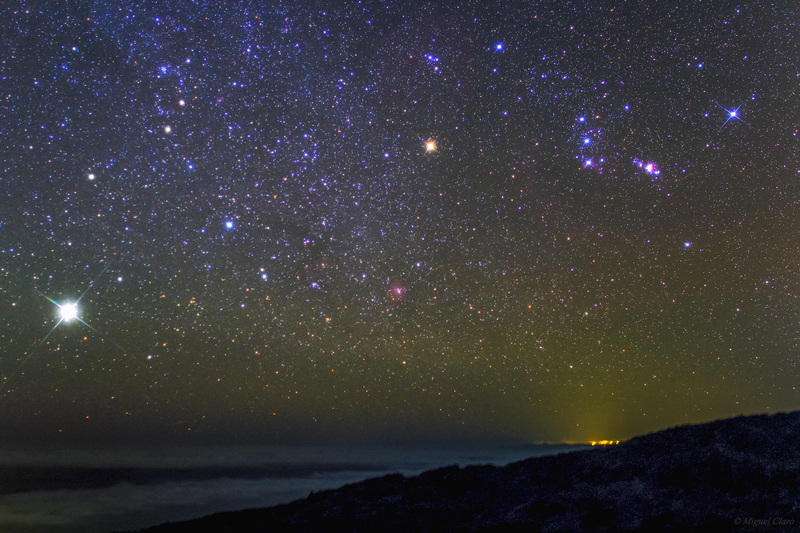 Above the clouds and near the horizon of Caldera de Taburiente – a very large volcanic crater with about 10 km across – lies the “orange” star Antares, from Scorpius constellation as seen on the right side of the image. In the oposite direction (at left), we can see some green and orange airglow bands. 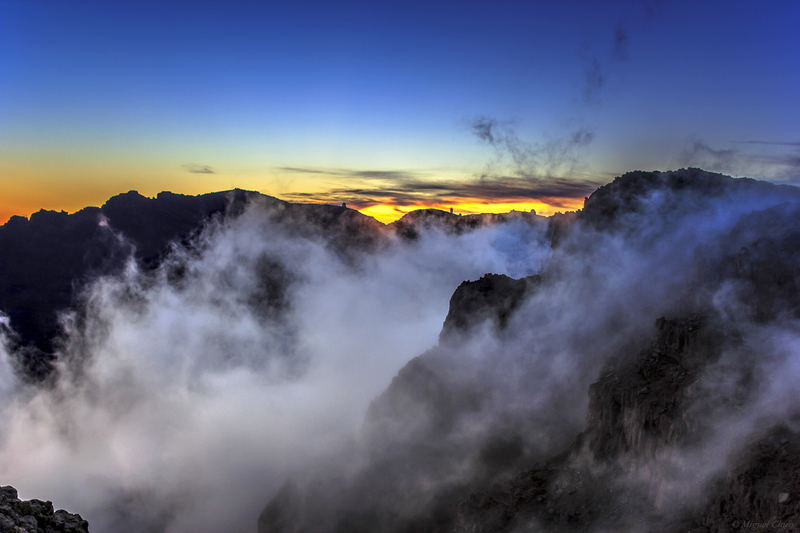 The picture was taken in Pico de La Cruz, La Palma, Canary Island. | Canon 60Da – ISO2000; 24mm at f/2; Exp. 20 secs. in 26/09/2013 at: 22h56 Mosaic of 20 images. 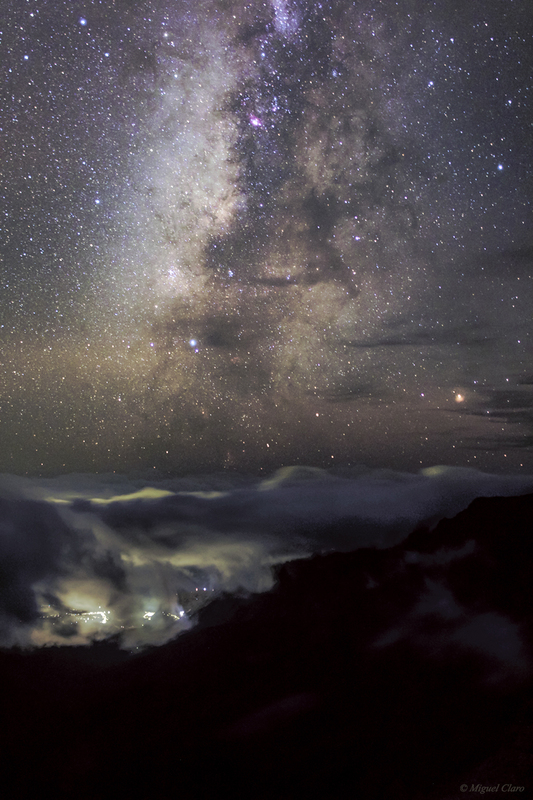 In this single image, captured in a height of 2,200 meters from the sea level, and above the clouds, we can see the central region of the Milky Way rich in gas and emission nebulae. Above the clouds and near the horizon is visible part of Caldera de Taburiente, a very large volcanic crater with about 10 km across. At the right side of the image, lies the “orange” star Antares, from Scorpius constellation. The picture was taken in Pico de La Cruz, La Palma, Canary Island. 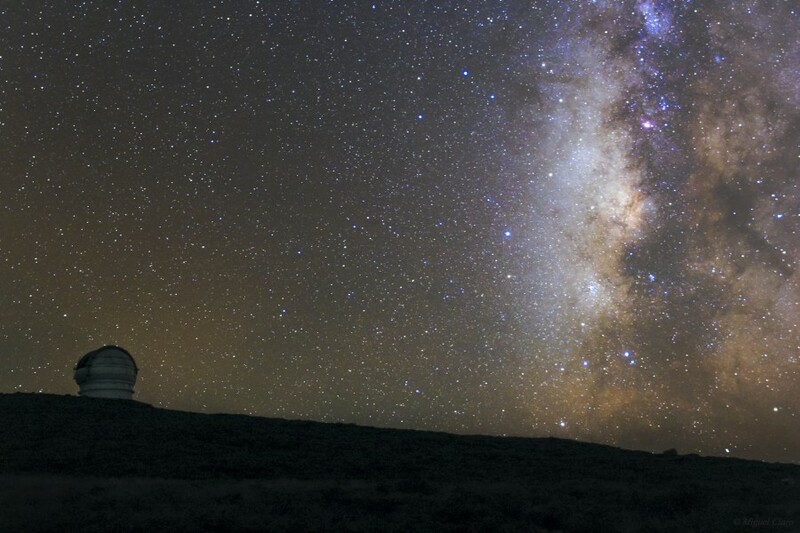 This picture shows the contrast between the excellent quality of the sky for astronomy in the Canaries – which is determined and protected by a Sky Law – and the effect of light pollution, coming from the city lights of Santa Cruz de La Palma, visible through a hole in the clouds in Caldera. 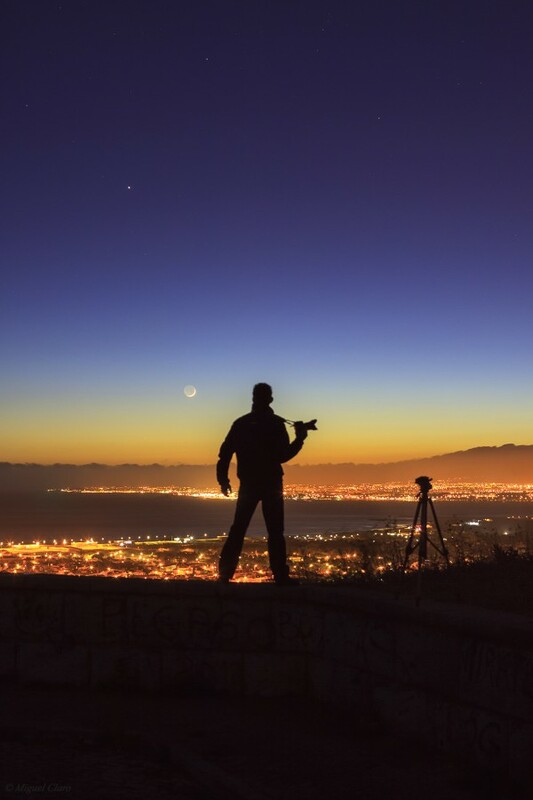 This picture shows a quiet moon scene viewed from Mirador de Las Ventas, in La Palma, the Canary islands, while some photographers are enjoying and capturing his own views of the moon between the clouds, and reflected in the Atlantic Ocean. I could be “lost in the beach” on the evening of 7 September, but actually I was claiming such a beautiful peaceful moment, enjoying the alignment between planets, Saturn (in the top left corner), Venus and Spica star (in the center image), and as it we following down this imagined diagonal line, we can finally find the Crescent Moon above the horizon. 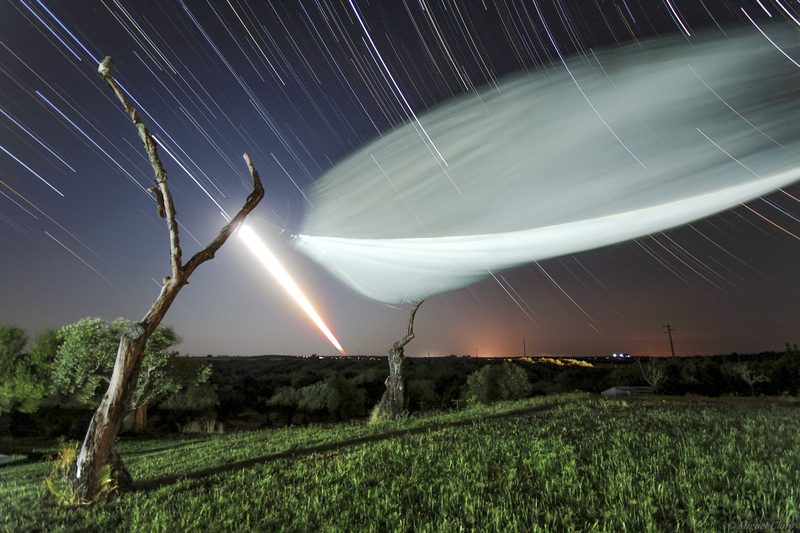 Image of the meteor shower Perseids, taken from Fonte-de-Telha, Portugal. Canon 50D – ISO1000; f/4; Exp. 25 secs. with 10mm, in 12/08/2013 at 4h14 AM. Sum of 32 images. At first sight and due to this particular “comet” shape, we could imagine that the long “white to orange” tail in the left center of the image, would be from the century´s comet, the ISON. At least, all of us have already heard that the most optimistic predictions, seems to pointing to a comet with a brightness as strong as the Moon. Well, either or not, it will be a great sky show indeed, providing good opportunities for images like that. In the left top corner – clearly visible in the still single shot picture – we could find in the arms of this dead tree, a sleepy sparrow, the perfect model for a night long exposure shot. Below right, the great trail with a “comet shape” isn´t from the ISON yet, but actually the path of the moon against a starry sky. 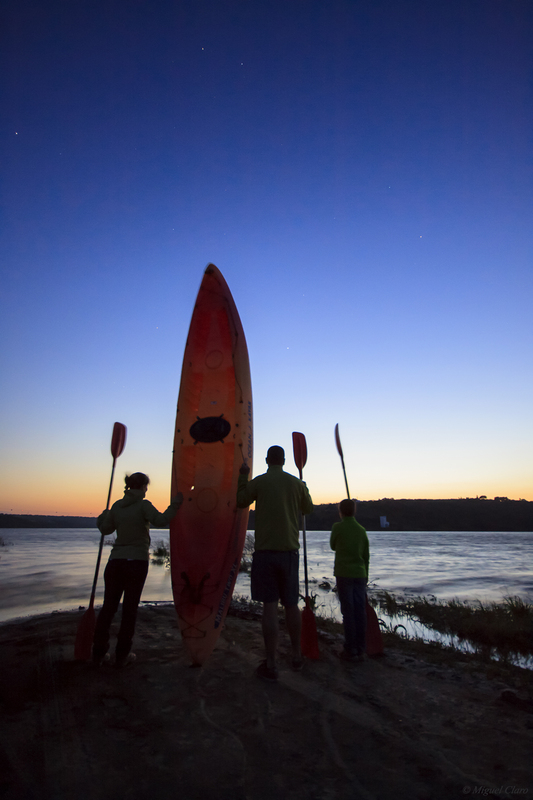 As it goes down, the brightness drops below and the color of the moon stays more yellow and near the horizon, can even reach a red tone. At right, the strange white shape, is from a awning of the Monte Falperras rural hotel, in Mourão, one of the great places to rest in the Alqueva Dark Sky Reserve, in Portugal. 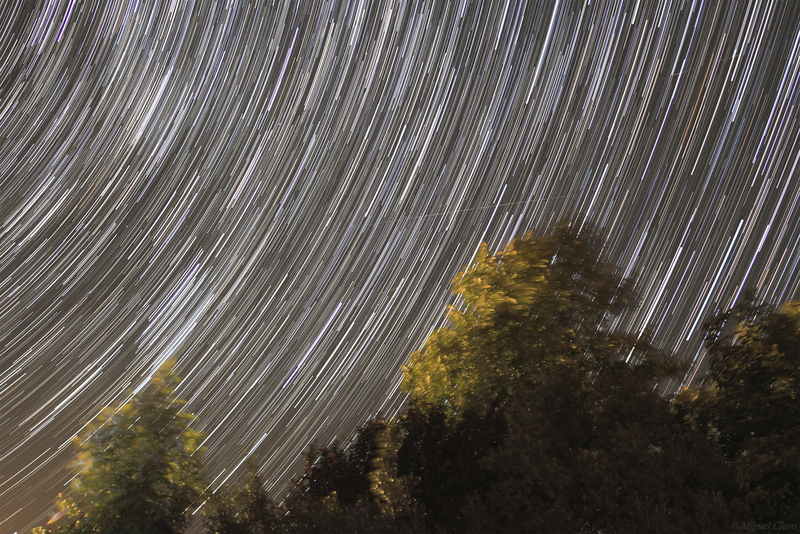 This startrail image composed by 195 images from 30 seconds each, was capturing in 15th July 2013 at 23h11, during the moonset, as we could appreciate in this 13 seconds Time Lapse sequence. 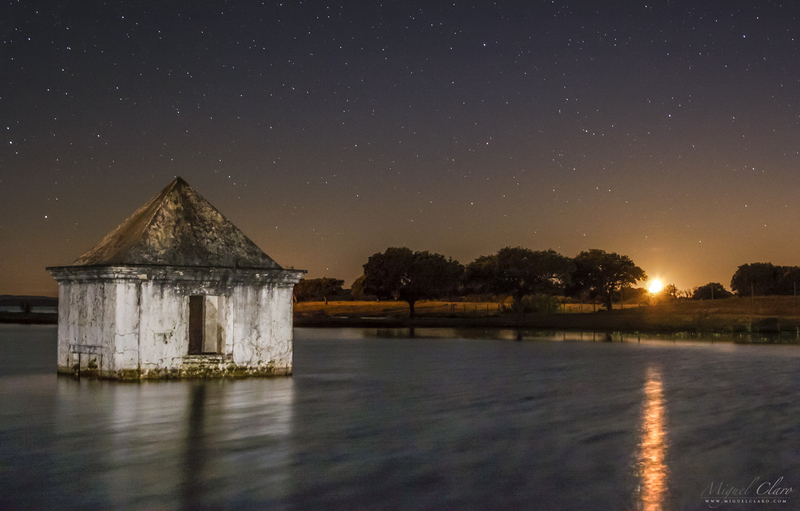 This serene view, captured on the great lake Alqueva, near the “Ermida de São Pedro” in Mourão, one of the regions belonging to the Dark Sky Alqueva Reserve, we find several scientifically interesting things. In the center of the picture we can see the natural colors of the most central region of the Milky Way, located near the Scorpio and Sagittarius constellation, where is it possible to recognize many deep sky objects like the Lagoon Nebula (M8) and the Trifid Nebula (M20). In the image was also possible to register a strong presence of Air Glow (Atmospheric Chemiluminescence) , the further thing I have seen similar to an Aurora, which crossed ahead the region of scorpion, with yellow light, by emissions from sodium atoms in a layer at 92 km. Above it, we could see the green light from oxygen atoms in a layer 90-100 km high. This emission layer is clearly visible from earth orbit. 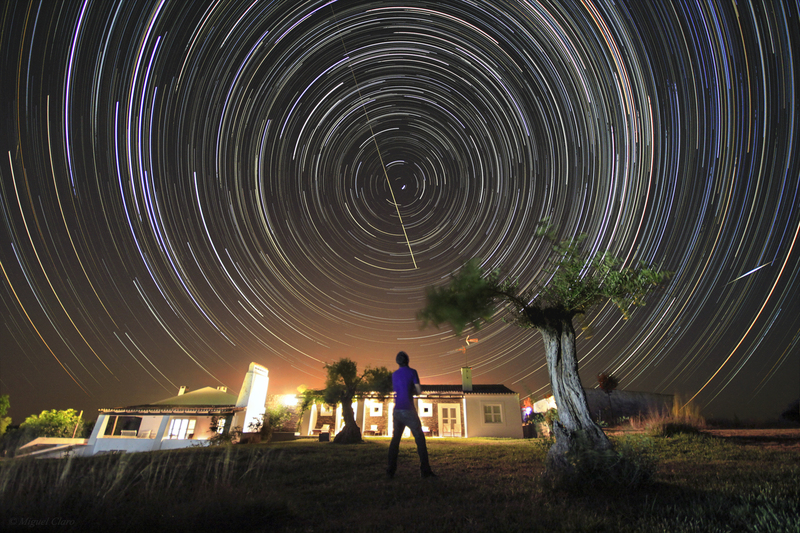 This “self portrait” startrail was taken in Falperras Hill, a rural hotel in Mourão, one of the regions covered by the Alqueva Dark sky Reserve, in Portugal. 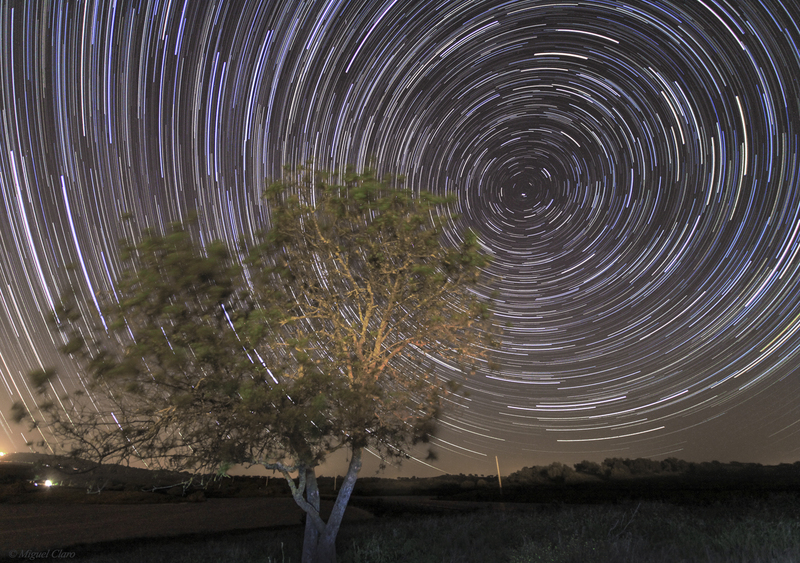 In this polar startrail we could easily identify the Polaris star – who indicates the North – not only because the “star vortex” seems to spin around this central star, but also due to the light path left by a satellite (not ISS), that seems to point to this same star. Below right in the sky picture, is also visible a strong flare left by satellite Iridium 66, with a magnitude of -4.5. In the land, we could see the Monte Falperras hotel, Myself enjoying this beautiful and peaceful moment – full of meaning – as well as two olive trees, the much typical tree available in the fields of Alentejo region. 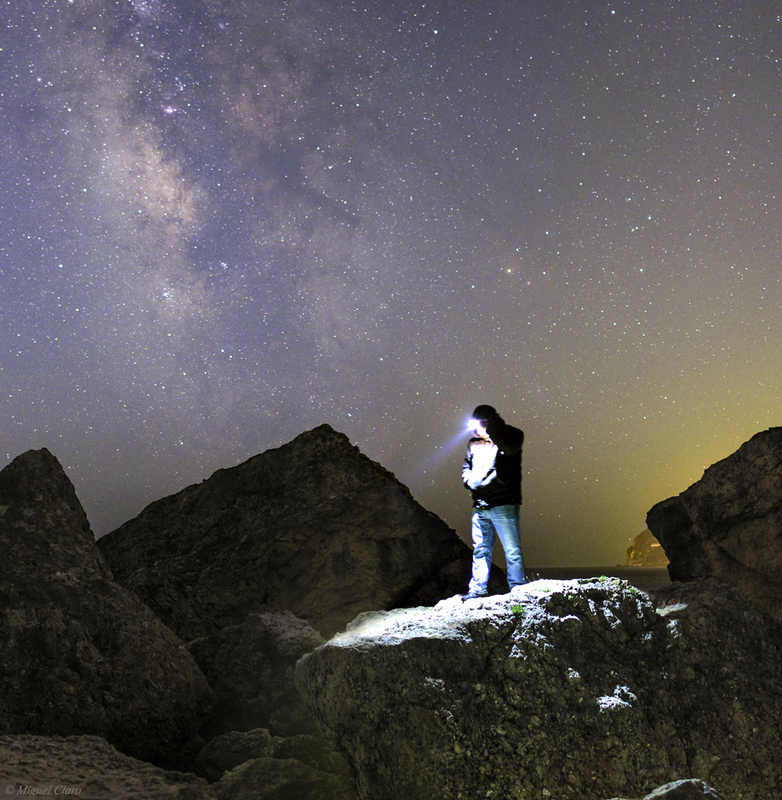 Canon 50D – ISO1600; 10mm f/4 Exp 30 secs. Sum of 344 images taken in 14/07/2013 between 22:53 and 01:59 AM. 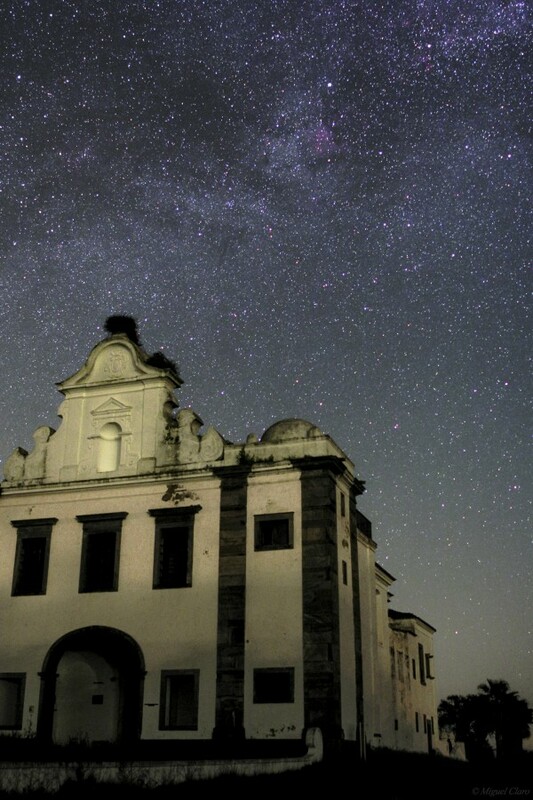 In this view captured in Monte Bravo, Mourão, one of the regions belonging to the Dark Sky Alqueva Reserve, we could appreciate the great Milky Way with the presence of the well known “Summer Triangle”, an astronomical asterism on the northern hemisphere’s celestial sphere, with its defining vertices at, Deneb, Vega and Altair, the brightest stars in the three constellations of, Cygnus, Lyra, and Aquila, respectively. But we also could see many infrared emissions coming from nebulas like the great North America Nebula NGC7000, clearly visible at the left side of Dened star, in Cygnus constellation. This serene view, captured on the great lake Alqueva, near the “Ermida de São Pedro” in Mourão, one of the regions belonging to the Dark Sky Alqueva Reserve, we find several scientifically interesting things. In the left top corner of the image, we could find the Cassiopeia constellation and below the double cluster NGC 884 and 869. 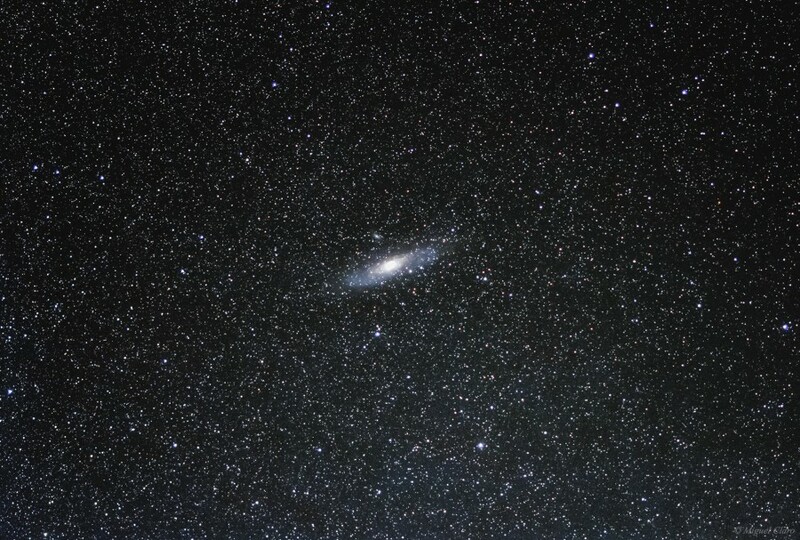 Almost in the center image, is clearly visible the great Andromeda Galaxy M31, in Andromeda constellation, the neighbor of Pegasus. Above the Alqueva Lake, is visible the strong presence of Air Glow (Atmospheric Chemiluminescence) , the further thing I have seen similar to an Aurora, with yellow light, by emissions from sodium atoms in a layer at 92 km. Above it, we could see the green light from oxygen atoms in a layer 90-100 km high. This emission layer is clearly visible from earth orbit. In this deep sky wide field view taken with a 70mm lens, we could appreciate a sky of endless colored stars, surrounding The North America Nebula (NGC 7000), an emission nebula in the constellation Cygnus, close to Deneb (the blue brightest star in the image center). At its right, we also could see the Sadr region, or IC 1318, a diffuse emission nebula surrounding Sadr or Gamma Cygni star (the second brightest star in the picture). But why we can find this colorful diversity of stars ? “Astronomers came to understand that bluer stars are intrinsically brighter because they are more massive than white or red stars, and more massive stars burn much faster and hotter than less massive stars. The bluish type-O stars, for example, are only 30-50 times more massive than yellow-white stars like our sun. But O stars burn a million times brighter, so they have far shorter lifetimes. O and B stars only last a few million years before they die in spectacular supernova explosions, while cooler and less massive K and M stars burn steadily for billions of years”. Canon 60Da – ISO1600; 70mm f/4 Exp. 119 secs. + Vixen Polarie mount travel. In 5/07/2013 at 3:30 AM (sinlge frame). In this image we could see two pictures taken at about the same time, day and place, but with a different focal lens, showing a deep travel from Monte Alerta, in Monsaraz (Alqueva Dark sky Reserve – Portugal) to a close approach to North America – not the country on itself – but the well known NGC7000 nebula with North America shape, near the Deneb star, in Cygnus constellation. 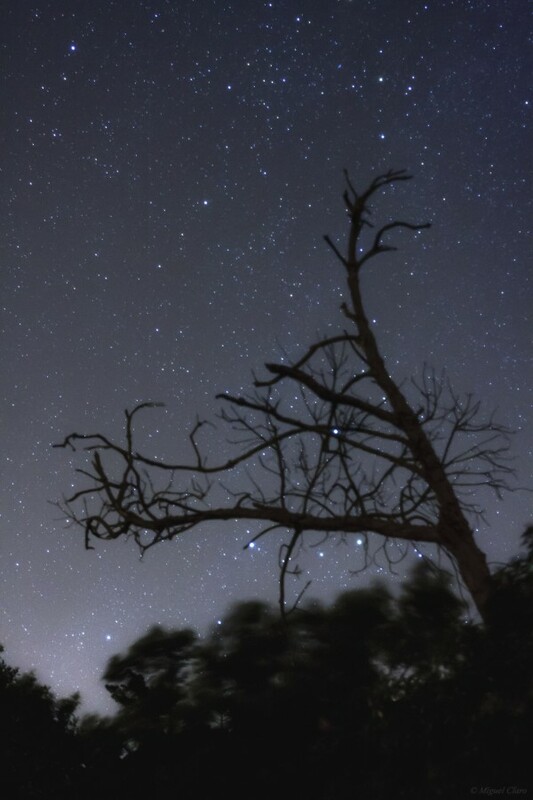 In the right picture, we could see part of the milky way region above a tree located in Monte Alerta, taken with a 24mm lens, and where it is visible the nebula IC 1396 and above it, near the Deneb star (top center), the NGC7000. In the left Deep sky wide field photo, taken with a 70mm lens, we could appreciate a sky of endless colored stars, surrounding “The North America Nebula” (NGC 7000), an emission nebula in the constellation Cygnus, close to Deneb (the blue brightest star in the image center). At its right, we also could see the Sadr region, or IC 1318, a diffuse emission nebula surrounding Sadr or Gamma Cygni star (the second brightest star in the picture). But why we can find this colorful diversity of stars ? ”Astronomers came to understand that bluer stars are intrinsically brighter because they are more massive than white or red stars, and more massive stars burn much faster and hotter than less massive stars. The bluish type-O stars, for example, are only 30-50 times more massive than yellow-white stars like our sun. But O stars burn a million times brighter, so they have far shorter lifetimes. O and B stars only last a few million years before they die in spectacular supernova explosions, while cooler and less massive K and M stars burn steadily for billions of years”. Below is a special image with the identification of all deep sky objects that can be seen, and the relation with the different focal distances. 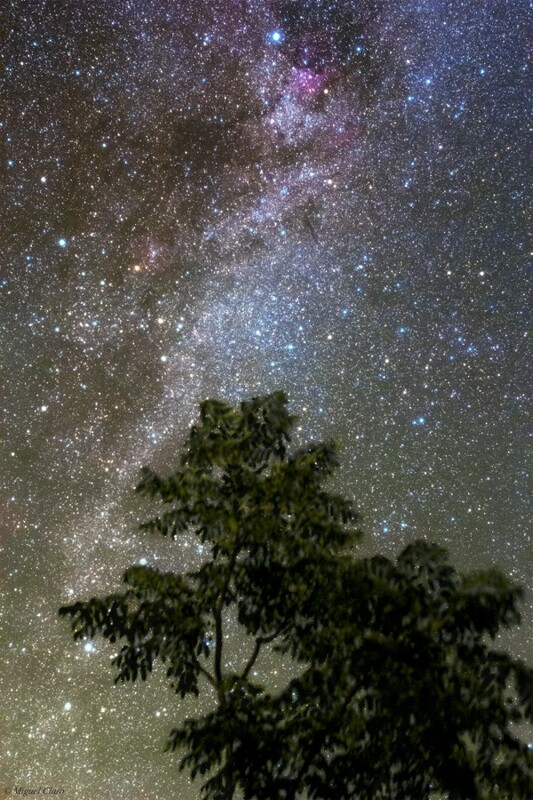 Image of the milky way region above a tree located in Monte Alerta, Monsaraz, and where it is visible the nebula IC 1396 and above it, near the Deneb star (top center), the North America Nebula NGC7000. For 70mm close up view of the NGC7000 area, revealing a lot of colorful stars as well as the Sadr region, just click here. 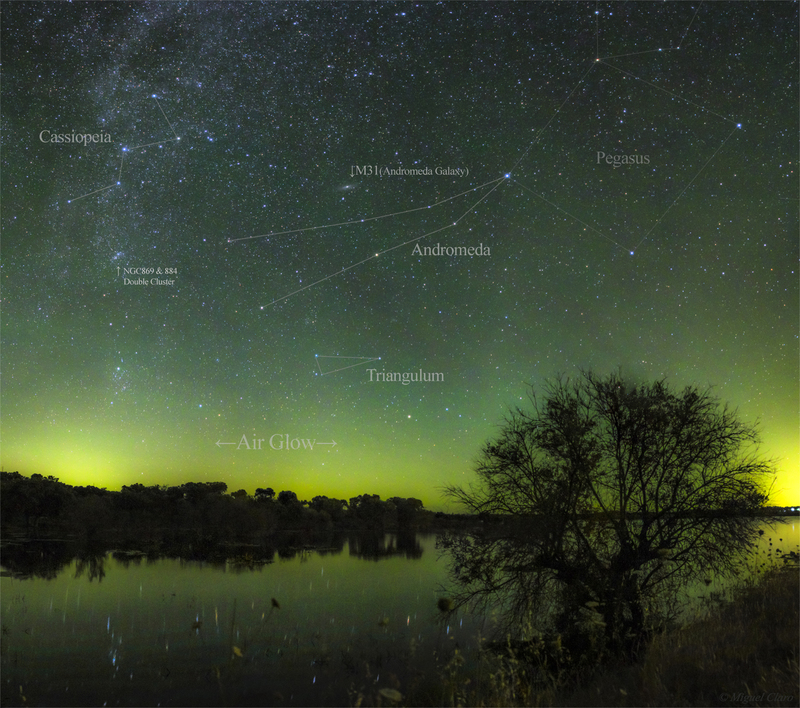 In this picture captured in the great lake Alqueva, near the “Ermida de São Pedro” in Mourão, one of the regions belonging to the Dark Sky Alqueva Reserve, we cloud see the strong presence of Air Glow (Atmospheric Chemiluminescence) involving the Big Dipper constellation (Ursa Major) with the green light from oxygen atoms in a layer 90-100 km high. This emission layer is clearly visible from earth orbit. In the image, is also visible the gravity waves effect. “These waves (internal gravity or buoyancy waves) abound in the stable density layering of the upper atmosphere. Their effects are visibly manifest in the curls of the stratosphere’s nacreous clouds, in the moving skein-like and billow patterns of the mesosphere’s noctilucent clouds and in the slowly shifting bands of the thermosphere’s airglow, as we could see in this picture and in the annotated version of this same image. 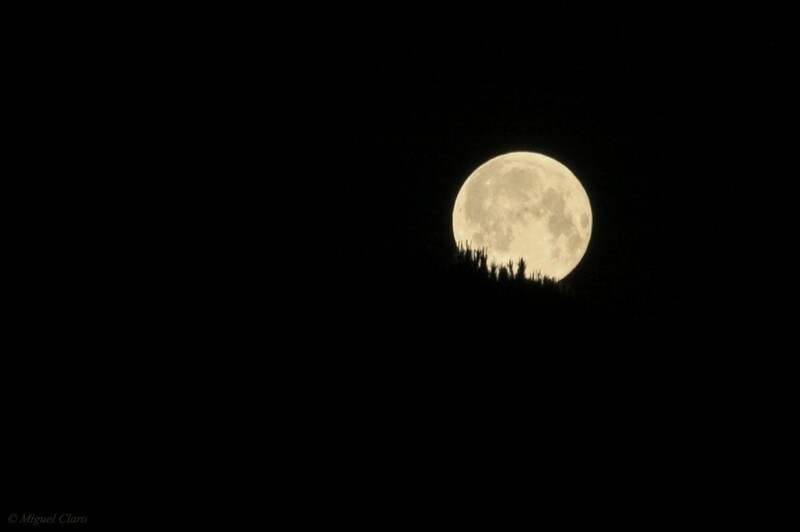 Picture of the Largest Moon of 2013. This “Super Moon” was 14% bigger and 30% brighter than other full Moons of 2013, was captured 2 km away from the subject, the Sesimbra´s Moorish castle. 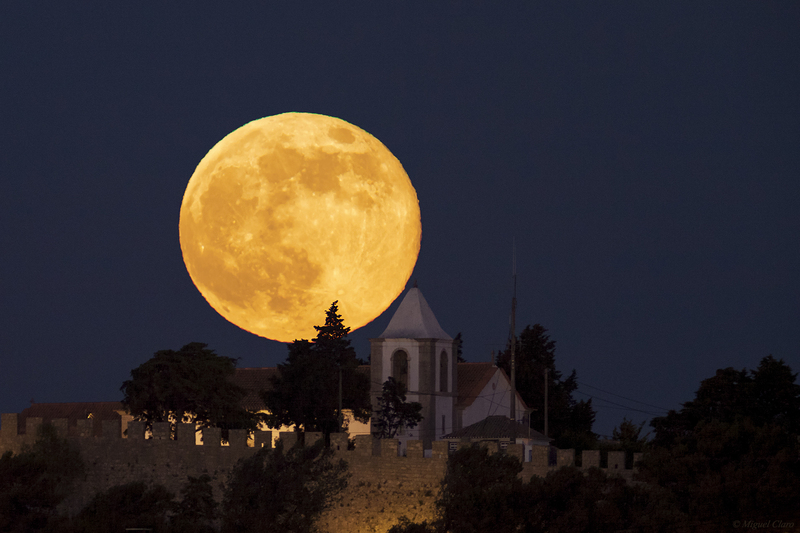 This huge Full Moon could be seen in the picture rising above the church Nossa Senhora do Castelo. It stands on the spot where king Sancho I built a Romanesque chapel in the early 13th century. 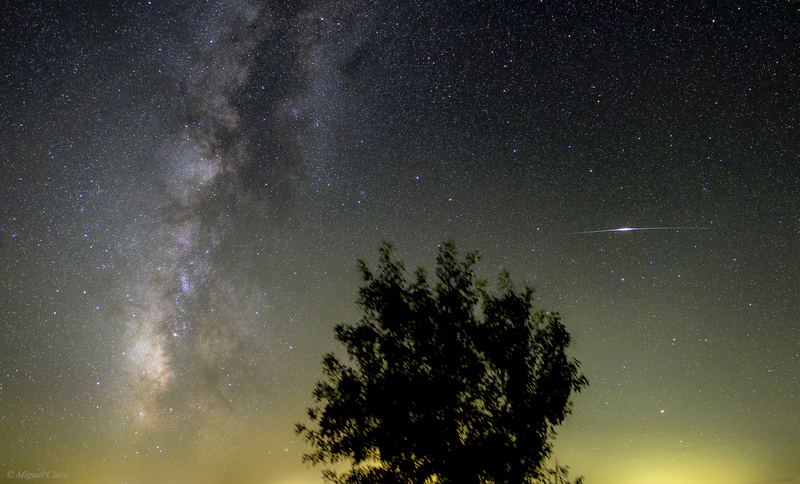 Image of an Iridium flare that occurred near the Milky Way, clearly visible on the left side of the image. The “Iridium Flare” is produced by the reflection of the antennas and solar panels from the Iridium satellite network. Sometimes, the increasing brightness can be 100x brighter than a star of magnitude “0”. In the image, the form of galaxy is caused precisely by increasing the brightness while moving simultaneously in the sky during the long exposure, leaving that characteristic appearance. These satellites can be observed with the naked eye, even from a big city like Lisbon. 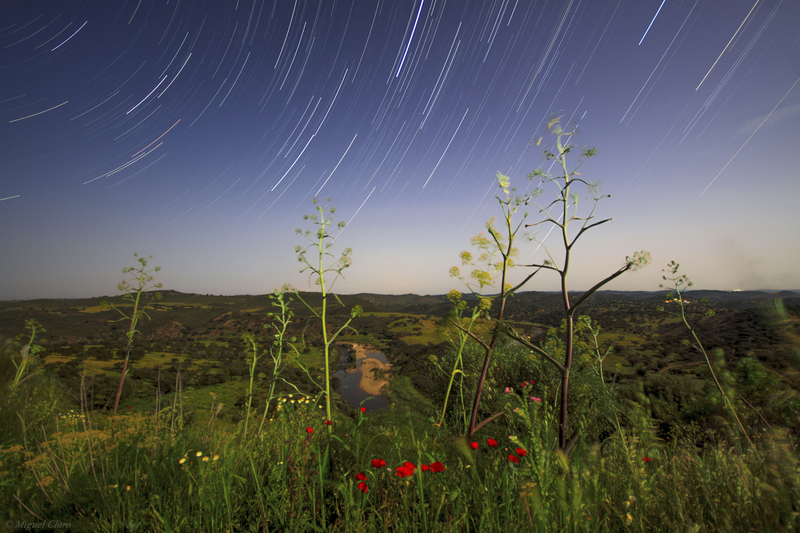 The image was captured on Monte Bravo in Mourão, the great Dark Sky Reserve Alqueva in Alentejo, Portugal. 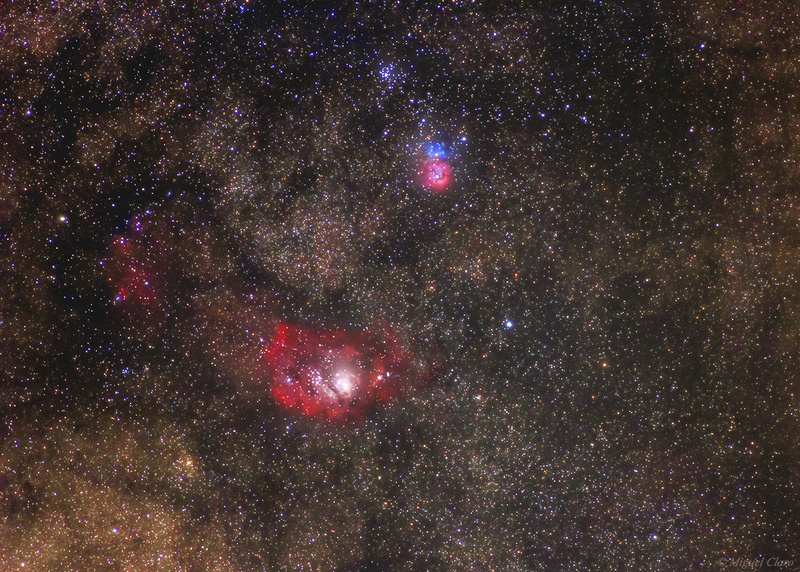 A wide-field view taken with the Polarie mount at a focal distance of 214mm, from the Lagoon Nebula (M8 – NGC 6523), the Trifid Nebula (M20 – NGC 6514) and above it, the star cluster M21. The M20 or NGC 6514, is well known as The Trifid Nebula located in Sagittarius, lieing at a distance of approximately 5000 light years from earth. This object is an unusual combination of an open cluster of stars; an emission nebula (the lower, red/violet portion), a reflection nebula (the upper, blue portion) and a dark nebula (the apparent ‘gaps’ within the emission nebula that cause the trifid appearance; these are also designated Barnard 85). Left above M8 is the Star cluster M21. Below the Trifid nebula is the The Lagoon Nebula (catalogued as Messier 8 or M8, and as NGC 6523) is a giant interstellar cloud also in the constellation Sagittarius. It is classified as an emission nebula and as an H II region. The Lagoon Nebula is estimated to be between 4,000-6,000 light years from the Earth. Canon 60Da; Lens: 214mm at F/5; ISO2500; Exp. 69secs. Sum of 5 images in Maxim DL taken in 16/07/2013 at 2h00 AM. 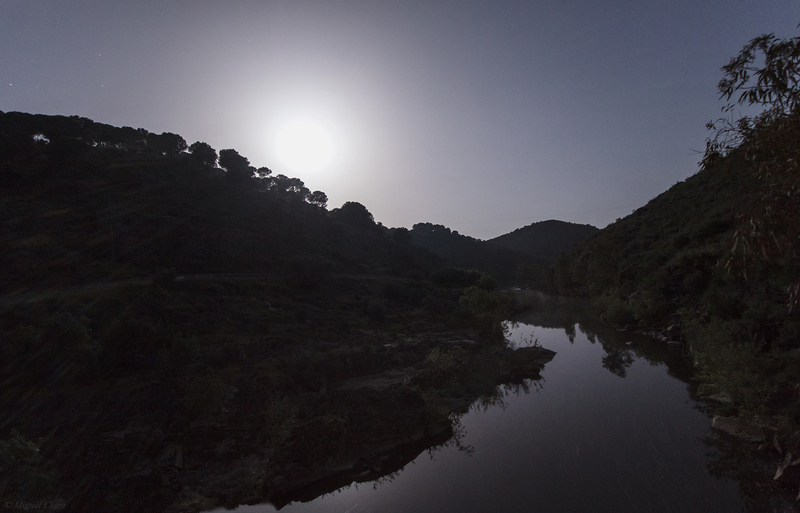 This is a panoramic photograph captured at dawn on the big lake Alqueva. In addition to the characteristic tones of a nautical twilight, in this case, morning, it is still possible to identify at left in the picture, the Big Dipper, lying down as it shaped farewell until next night … it is now time to rest, and give rise to the birth of the Sun King who will reign all day, filling with Life and Light, this beautiful planet that is our EARTH, from another perspective, seen as a small blue dot suspended in the Universe (the well known Pale Blue Dot). 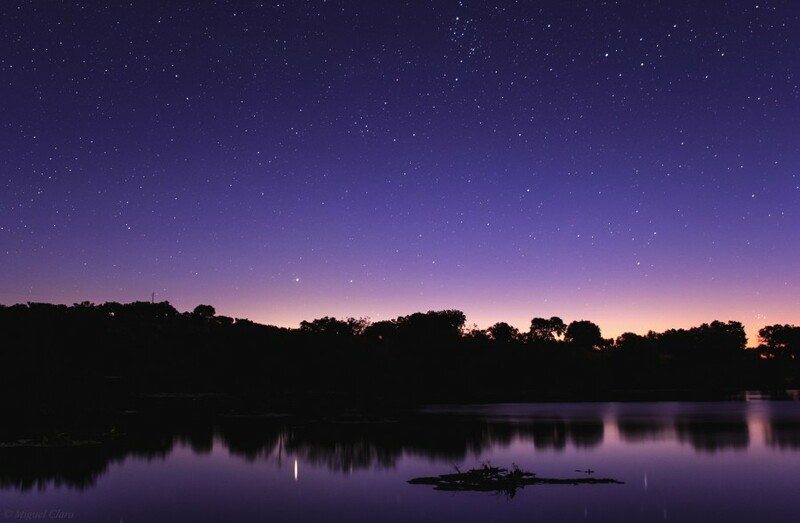 Taken just before dawn, in the region of Lake Alqueva and near the Chapel of St. Peter, in Mourão, where stars mingle with the rich tones of morning nautical twilight. On the left, the most visible reflection in the water belongs to the star Capella, as the extreme right over the horizon and through the tree, almoste hiden, is the Pleiades (M45). The upper cluster of stars in the image belongs to the central region of the constellation Perseus. 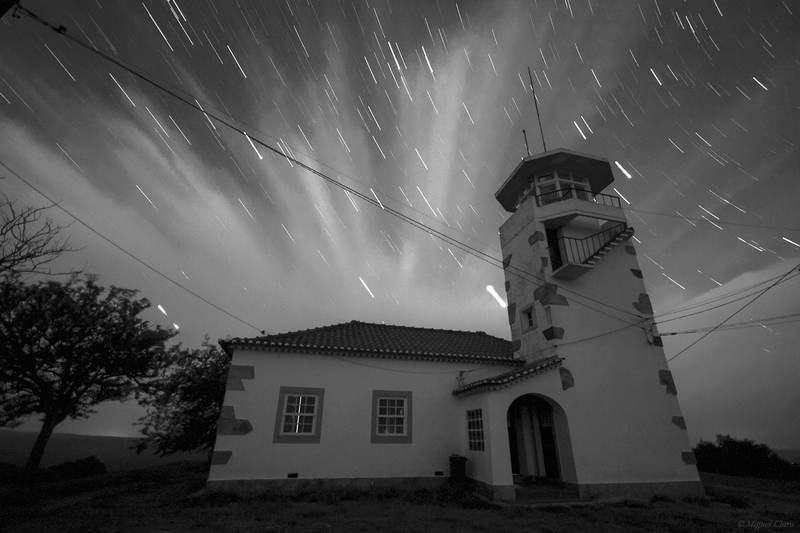 Black and white view of the Milky Way in a vertical picture where prevail the clouds of gas and star dust, which rise above the huge lake Alqueva, in the region of Mourão, about 15km of Monsaraz, both of them, places from Dark Sky Reserve in Portugal. In this amazing region, the sky reveals a contrast and depth even greater, since it is away from some sources of moderate light pollution. 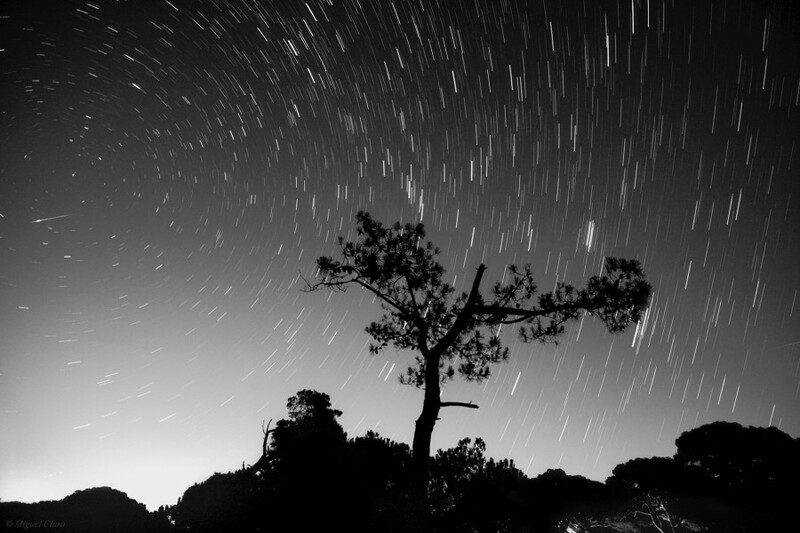 This startrail captured in a region of the sky facing south and where is present part of the Milky Way, thus causing a nuance of shades that blend background with well-marked trails of stars in the sky. These tracks, reflected in the lake as if they were “written” by a needle of a seismograph, also due to the effect of polarization, a characteristic effect of the water, allows accentuating the true color of the stars … well reported at the bottom of the image. The hottest stars are blue. 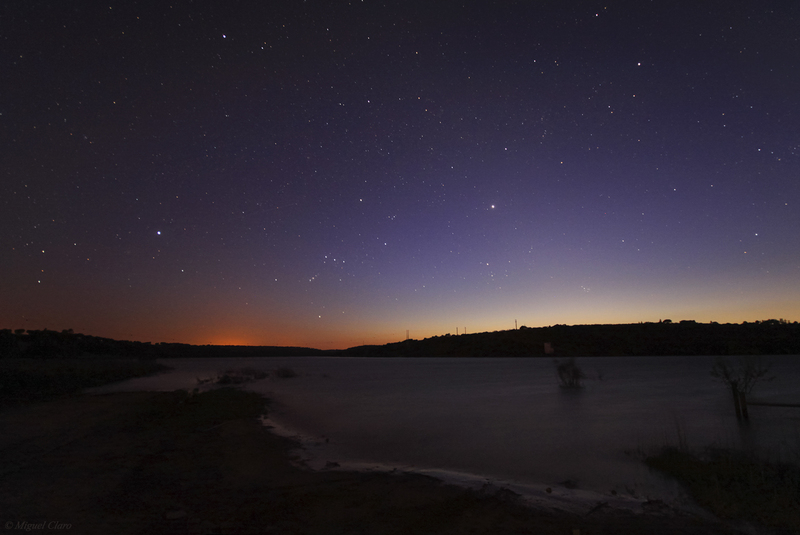 The most blue pronounced reflection is caused by the Shaula star, which lies at the tip tail of the Scorpion, as we were able to confirm this “with the natural seismograph” better known as “Great Lake Alqueva” and part of Dark Sky Reserve. 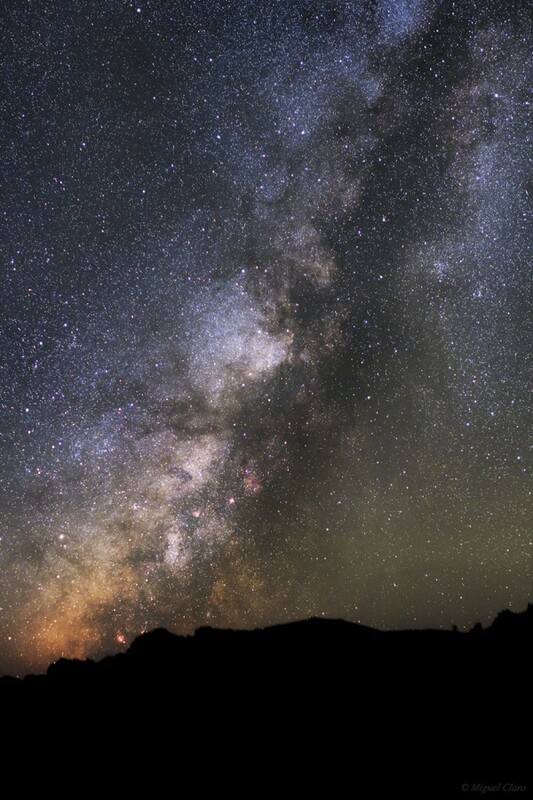 A view of the Milky Way in a vertical dizzying mosaic up to the Zenith. As a photographer and book author, I’d say: maybe an image in a “tab book format” where we can still see the yellowish effect of ariglow and the area of cloudiness (gas and dust) that make up the Milky Way, with several emission nebulae visible in the image (in violet tone). The picture was taken in a region of the Hermitage of San Pedro, in Mourão. The brightest stars have left his trademark on the calm water, which mirrored again, the beauty of the universe! 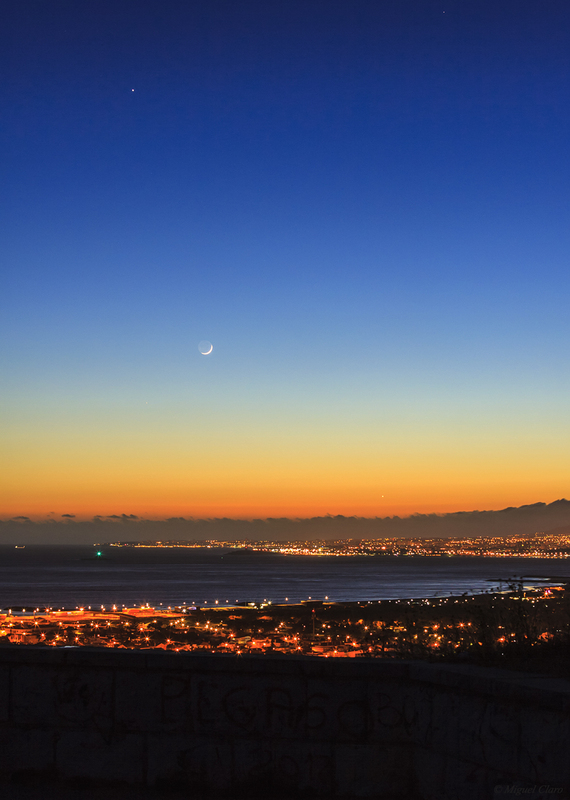 Panoramic view over Almada City and Lisbon at the Nautical Twilight, with the Full moon rising above the Eastern horizon (right side of the image), while at the same time but in the opposite direction, the planets Venus, Mercury and Jupiter, are aligned in a triangle formation, setting in the Western horizon (left side of the image).In this panoramic picture is also visible the smooth light transition in the sky, with the end of Nautical Twilight and the beginning of Astronomical Twilight (almost night), at right. Facing to North, is visible the great lighted Monument Christ the King and at the left side of it, part of the 25 April Bridge that connects Almada to Lisbon. Self portrait of the conjunction between Jupiter (the Brightest star in the image) and Crescent Moon with the disc only 3% illuminated by the Sun. Near the horizon, is visible the city of Lisbon. Self portrait of the conjunction between Jupiter (the Brightest star in the image) and Crescent Moon with the disc only 3% illuminated by the Sun, and where is visible the Earthshine effect. Venus, also in conjunction, was covered by the cloudy band in the Lisbon horizon. While I was enjoying this beautiful and gold moment, holding my camera, I remembered to take a “Macro photo of the moon, maybe the first macro-moon shot from planet earth :=) “, but is it possible ?, yes it is, just take a look to the second picture, I only have to approach my lens camera, to the lunar limb :=) Images taken from Capuchos, Almada, Portugal. Canon 50D – ISO400; Exp. 2sec. F/4; 35mm. 11/05/2013 21h41 and 21h43. 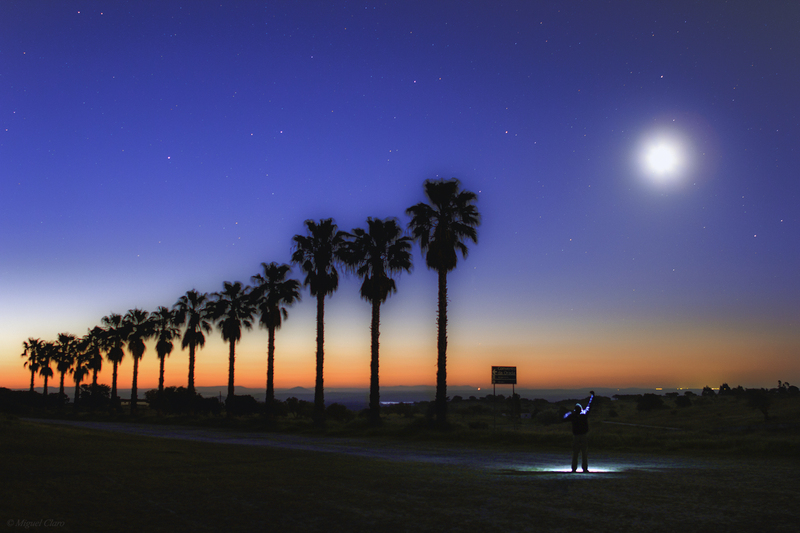 Alignment between Jupiter, Crescent Moon and Venus, captured from Capuchos village, in Almada, Portugal. Jupiter is the bright star in the left upper corner. Venus is the bright star near the yellow/orange sky, and the cloudy band. Near the horizon is visible the city of Lisbon. A stargazer above the rocky region of Portinho da Arrábida, Portugal, with the Milky Way behind it, visible in the dawn. Canon 60Da – ISO 1600; Exp.15 Seg; f/2.8; 24mm. In 11/05/2013 at 05h10 AM. 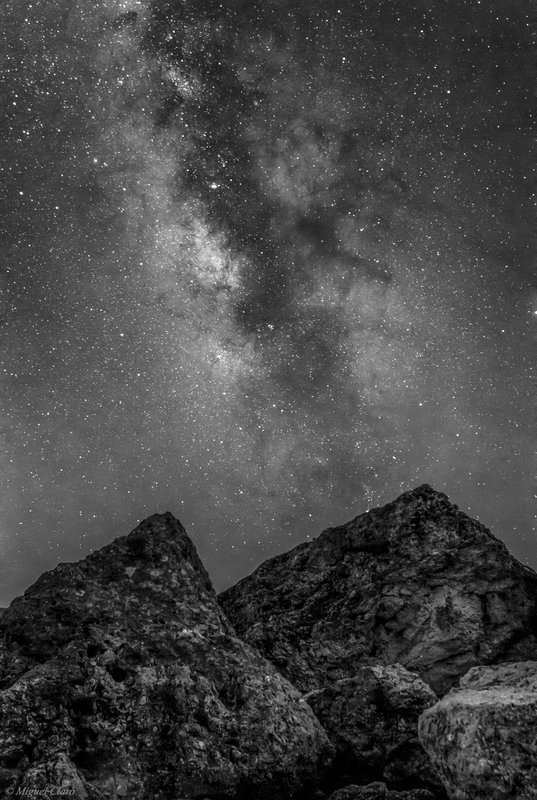 Image of the center Milky Way above the rocks of Portinho da Arrábida, Portugal, shown here – like natural pyramids due to the perspective – in this black and white starry view. Canon 60Da – ISO 1600; Exp.15 Seg; f/2.8; 24mm in 11/05/2013 at 04h58 AM. 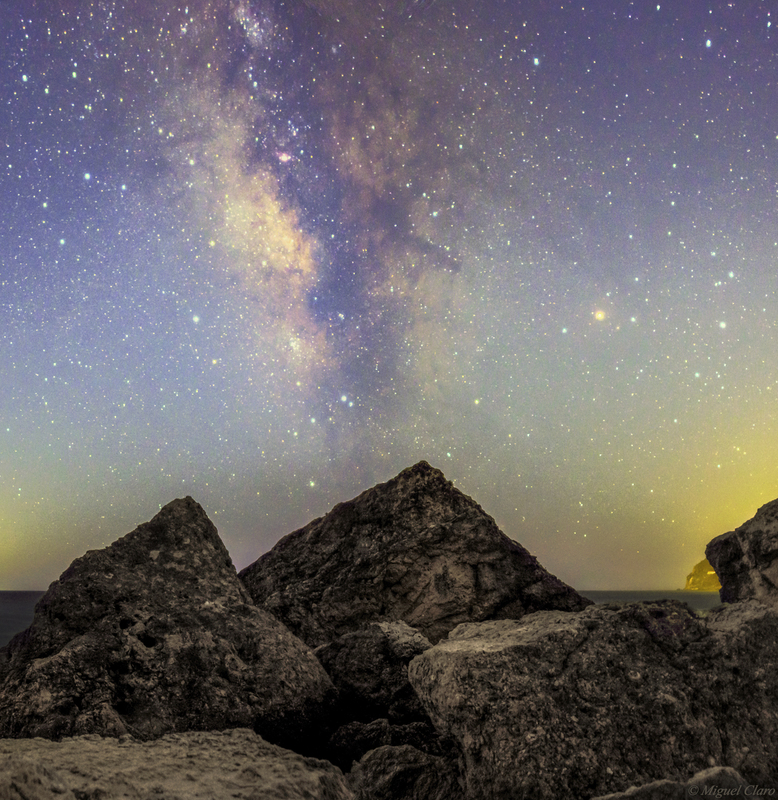 A rocky region of Portinho da Arrábida, Portugal, with the center of Milky Way behind it, visible at the dawn – almost in the daylight – with the stars of Saggitarius and Scorpius clearly visible, while the sky is turning blue, slowly. Canon 60Da – ISO 1600; Exp.15 Sec; f/2.8; 24mm. In 11/05/2013 at 05h14 AM. 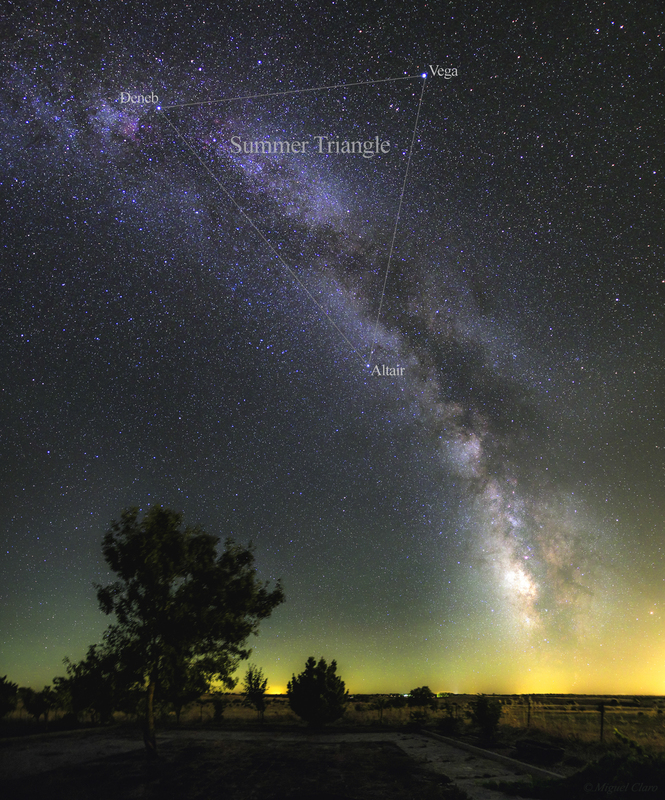 Below is the image with the sky identification. A colorful startrail captured in the Arrábida´s mountain, Portugal, facing to North, creating a light vortex around the Polaris, well known as the Northen Star. 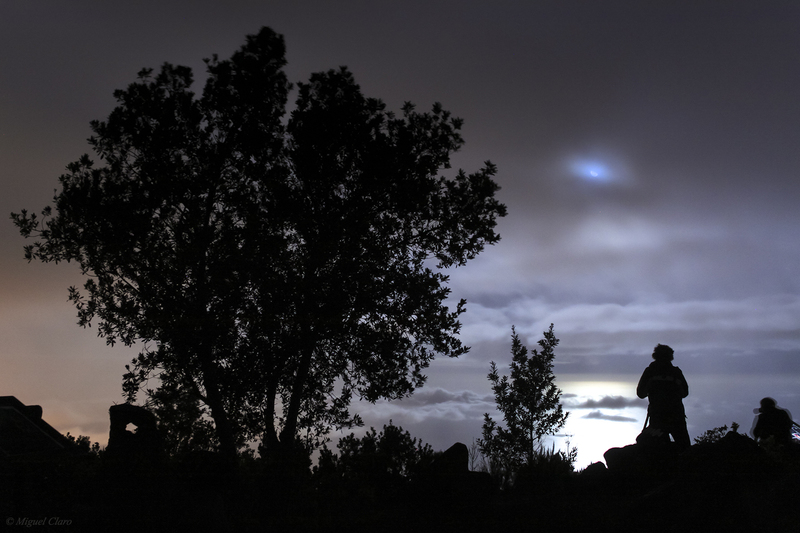 Canon 50D – ISO 1600; Exp.15 Ses; f/2.8; 35mm in 11/05/2013 at 04h50 AM. 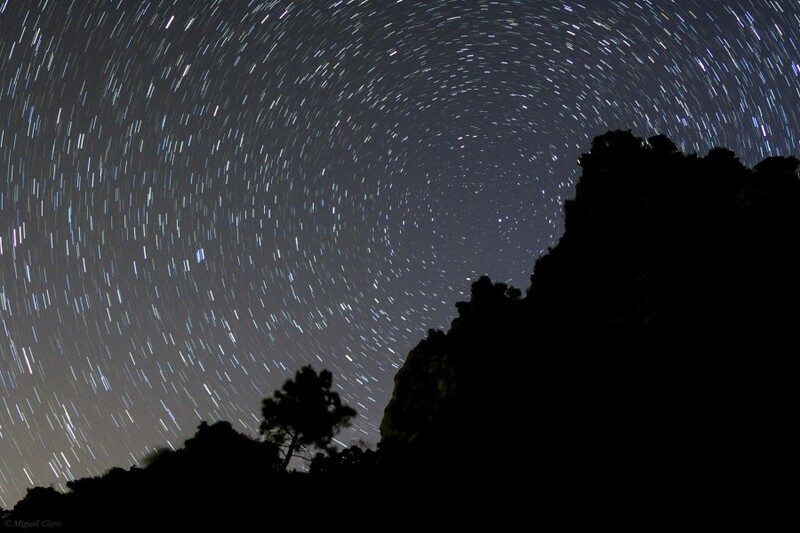 Silhouette of the Arrábida mountain with the sky full of “light tracks”, presenting the different colors of the stars, pointing to the region of the Milky Way where lies the Cygnus constellation. 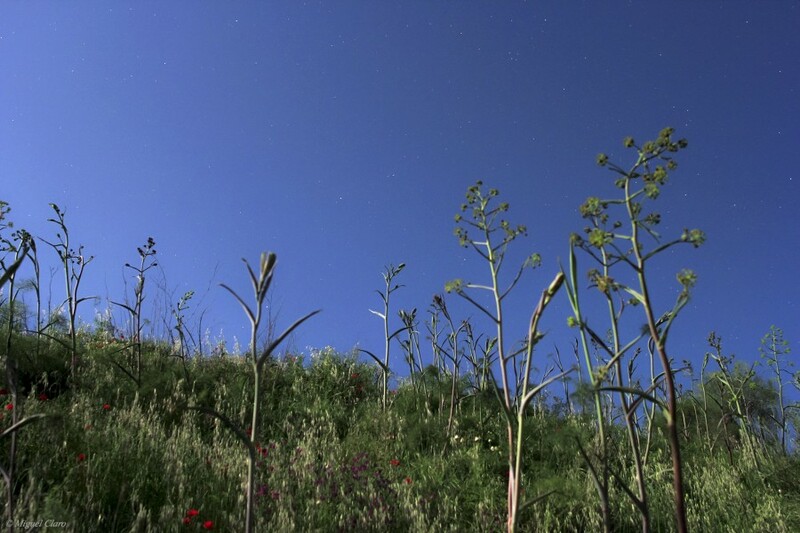 Canon 60Da – ISO 1600; Exp.15 Sec; f/2.8; 24mm in 11/05/2013 at 03h35. Sum of 164 images. 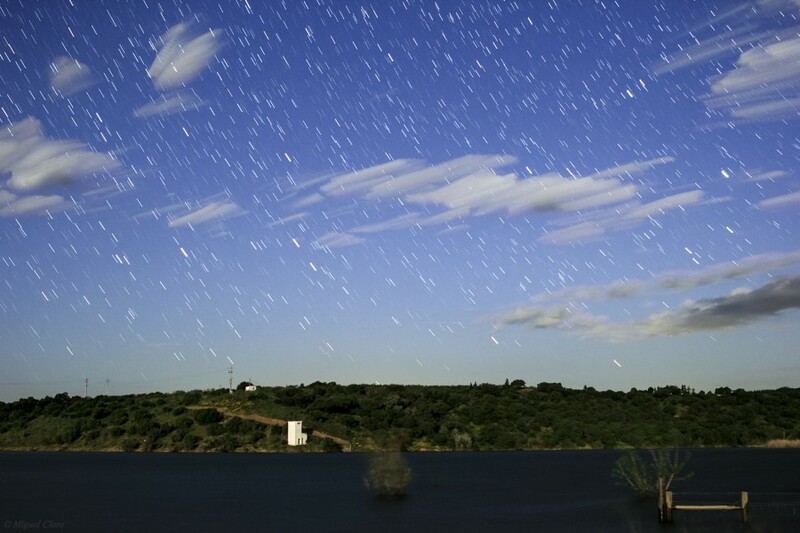 In this starry cloudy moonlit, we could watch what actually seems to be a rainy night, but, indeed, it was not rain, but a short startrail in a cloudy and windy night, above the alqueva´s lake, in a region called Albufeira de Pedrogão. Thanks to light of the moon, wind and clouds, I´ve got this peculiar result, I´ve called: “the painting of nature”. 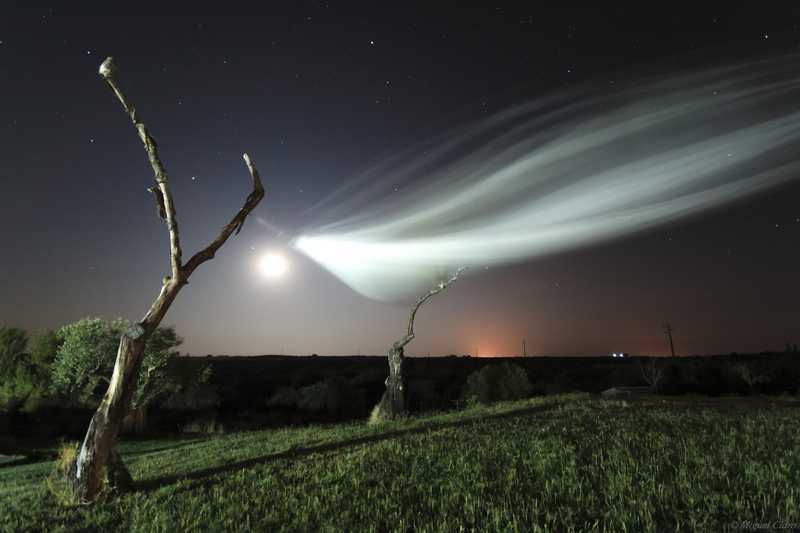 Below is a Short time lapse sequence, of a cloud formation under the moonlit and above the Pedrogão´s Albufeira, in Moura, a region of the Dark Sky Alqueva Reserve. The Big Dipper in a moonlit sky. 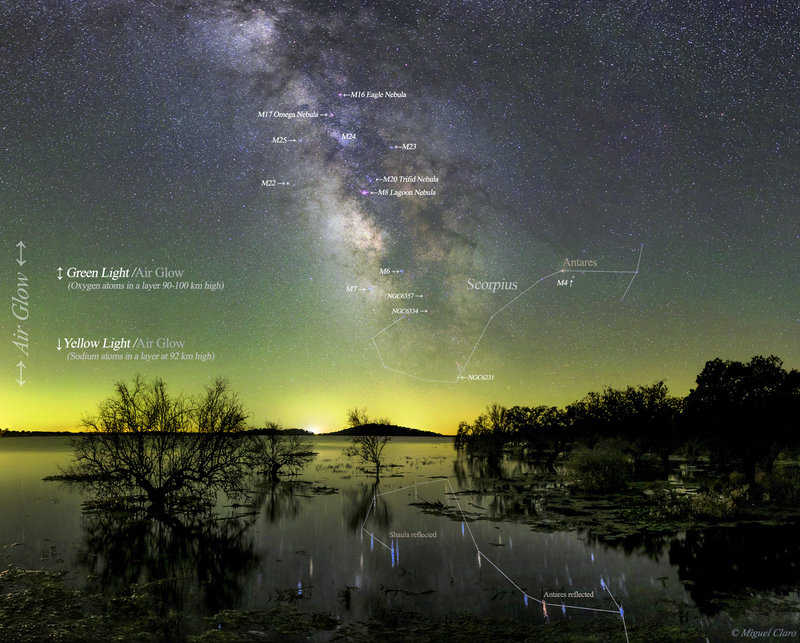 Image captured above Pedrogão´s Albufeira, in Moura, a region of great Alqueva´s Lake, covered by the Dark Sky Reserve. 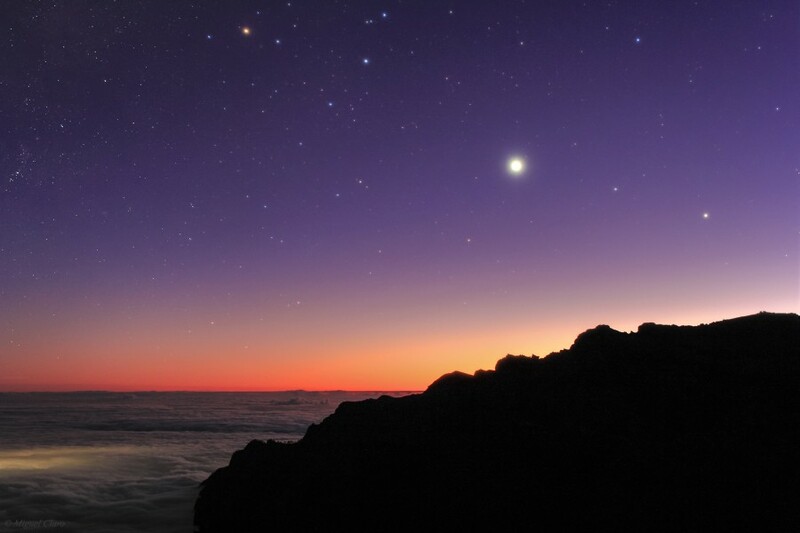 Nautical Twilight and a smooth zodiacal light in the direction of Jupiter, visible near the center image, as the brightest star. 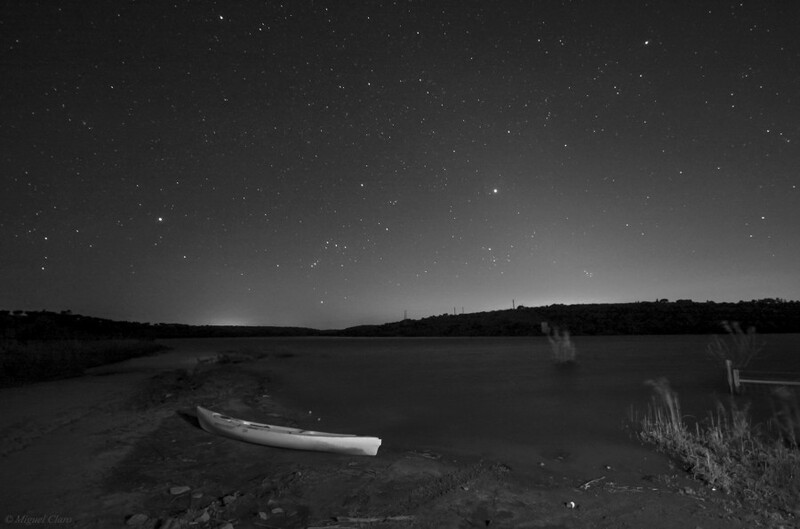 Image captured in the Pegrogão´s Albufeira, a region of great Alqueva´s Lake, covered by the Dark Sky Reserve. 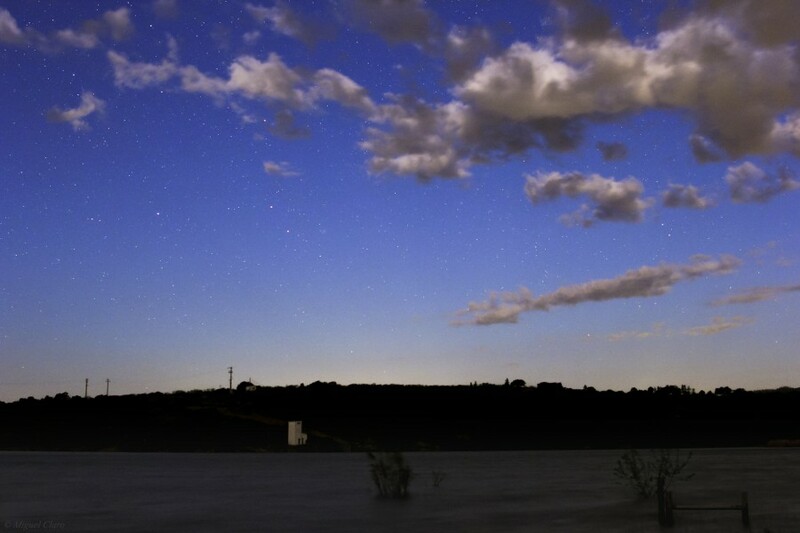 Panorama of a Starry cloudy twilight above the Pedrogão´s Albufeira, in Moura, a region of great Alqueva´s Lake, covered by the Dark Sky Reserve. Jupiter, visible near the center image and low in the horizon, is the brightest star. Above it, is visible the entire constellation of Auriga. 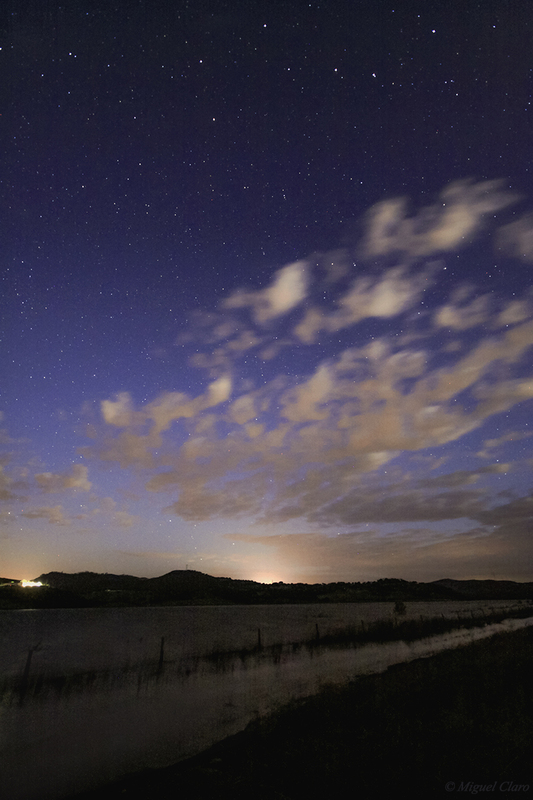 After the sunset, in the begining of twilight, only the brightest stars can emerge from the blue lighted sky, normally only the planets have light enough to do this, like we can see in the upper left corner, with the planet Jupiter shining against this dramatic sky and landscape, captured in the Contenda homestead. 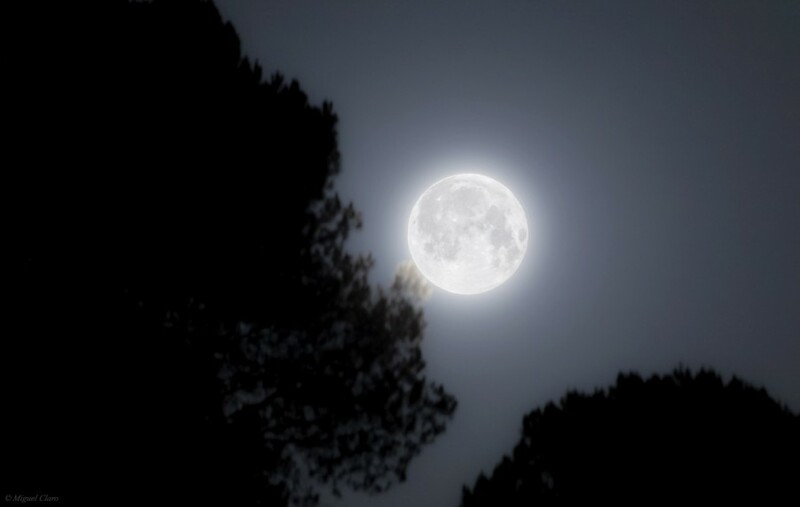 The Full Moon captured few hours after the partial lunar Eclipse, above the trees in the Noudar natural park, in Barrancos, Portugal. Near the center image, we could see the detail of the branch that is shining by the light of the moon. 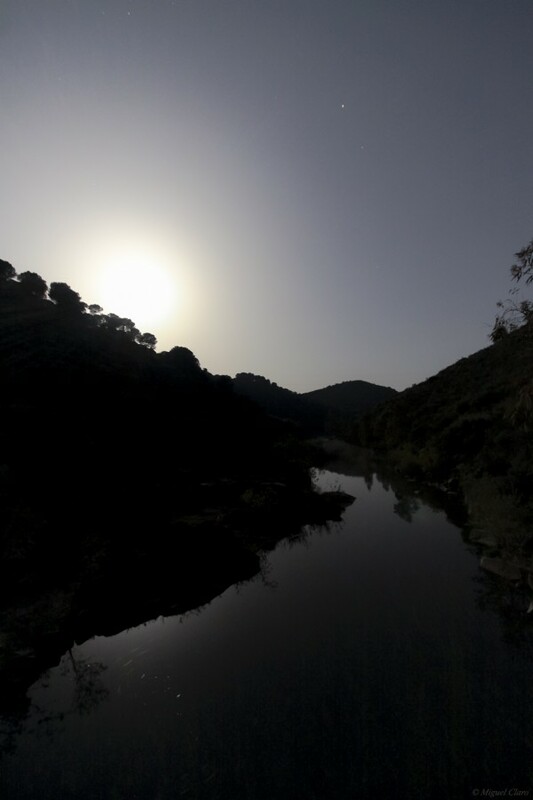 The Full Moon captured few hours after the partial lunar Eclipse, hidden behind the trees of the Noudar natural park, in Barrancos, Portugal. Above it, in the sky, is visible the planet Saturn. 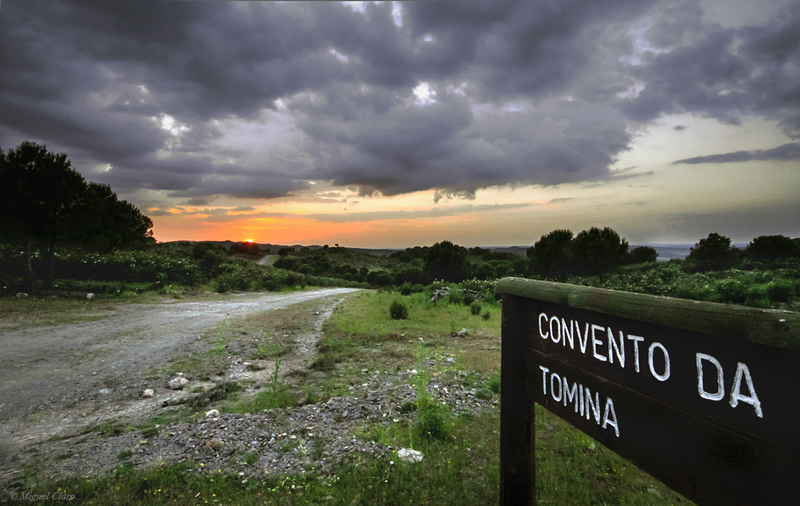 The landscape in the sunset captured near Convento da Tomina region, a area inside the great Contenda homestead, near Moura and Barrancos, Portugal. Canon 50D – ISO800, f/5; Exp. 1/250s ; 10mm. 26/04/2013 at 20h09. The Full Moon captured few hours after the partial lunar Eclipse, above the trees in the Noudar natural park, in Barrancos, Portugal. The green landscape of Noudar´s natural Park, in Barrancos, Portugal, iluminated by the strong light of Full Moon, turning the night in day. 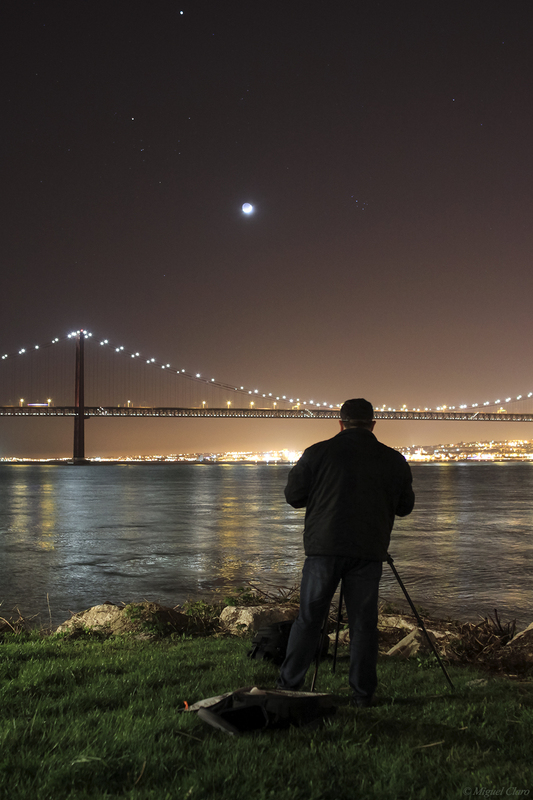 During one of my astrophotography workshops, I had the opportunity to catch the moment when one participant was photographing the Earthshine and Crescent Moon in conjunction with the open clusters Pleiades (M45), above the 25 April bridge, in Lisbon. Canon 50D – ISO800, f/2.8; Exp. 1s ; 24mm. 13/04/2013 at 21h51. Short sequence of the moon while the Earthshine effect is visible on its surface, the moon is passing behind the 25 April Bridge, until it sets behind the Lisbon city, after the passing of a huge cargo boat moving across Tagus river. Nautical twilight at dawn in Monsaraz. The moon shining in the stargazer like a cosmic ray of light. Canon 60Da – ISO1250; 24mm; f/2.8; 13 secs. 06/04/2013 at 06h04 AM. 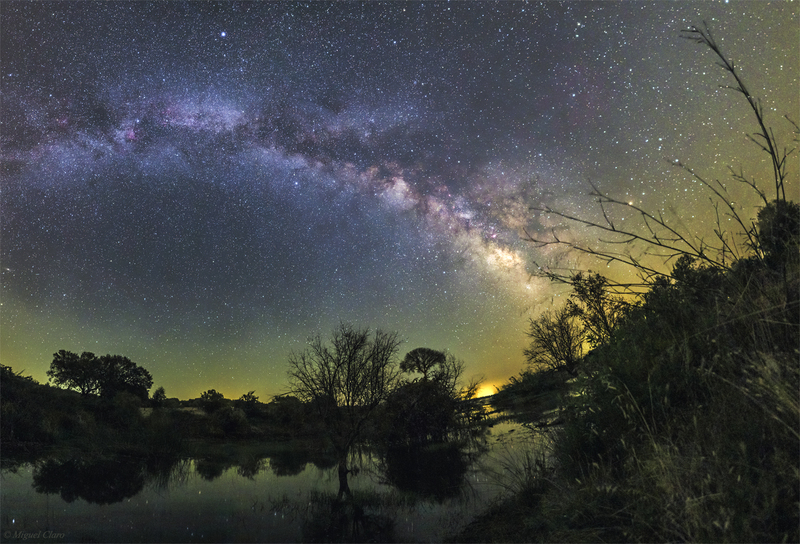 With the arrival of spring, the Milky Way begins to be visible in the skies of Portugal at dawn, in this image, captured in Monsaraz, in the Alqueva´s Dark Sky Reserve, you can watch it in plenty, thanks to this mosaic of 21 images that allows a large field of view, revealing this “arm” of our galaxy above the Convent of Orada (dated 1670). 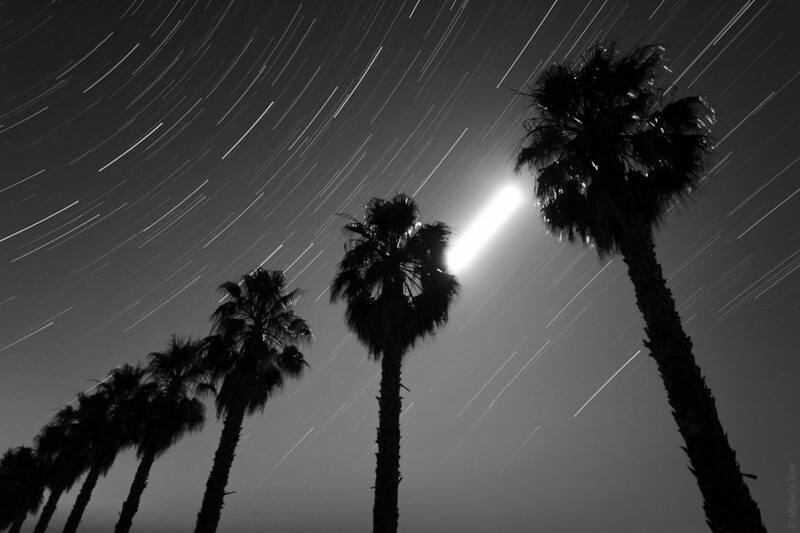 Near the center and right of palm trees, the moon shines brightly, although not interfering with the giant arc of the Milky Way where it is possible to distinguish a lot of constellations like Ursa Minor, with the polaris star to the left of the image, until the swan (Cygnus), with its North America nebula (NGC7000) clearly visible, down to the right, we still find the constellation of Sagittarius and Scorpio, with the brilliant super giant star, Antares. Canon 60Da – ISO1600 Lens 24mm f/2; Exp. 15 secs. Mosaic of 21 images, taken in 06/04/2013 at 5h32 AM. 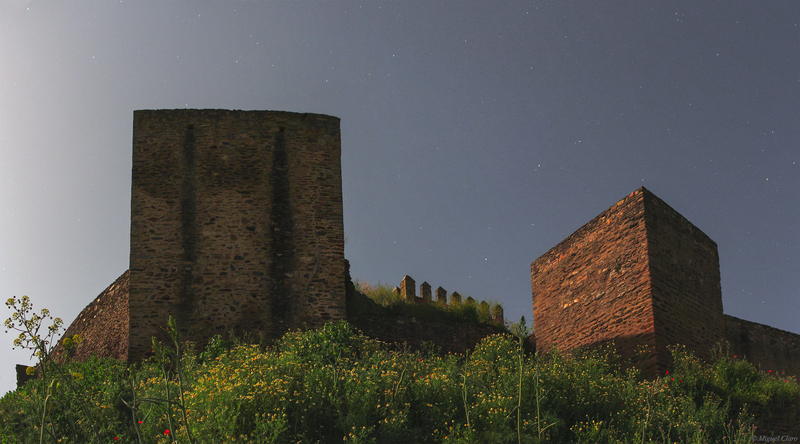 Twilight at dawn in Monsaraz with the moonlite. In the left upper corner we could see the trail of a shooting star. A startrail around the polaris star, where we could see a lot of many trails with different colors, due to the real color of each star. 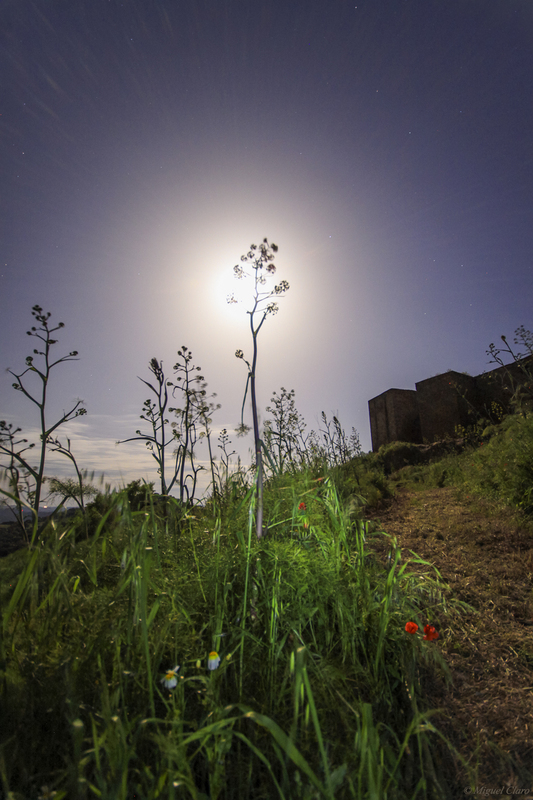 The image was captured in Monsaraz, in the Dark Sky Reserve.